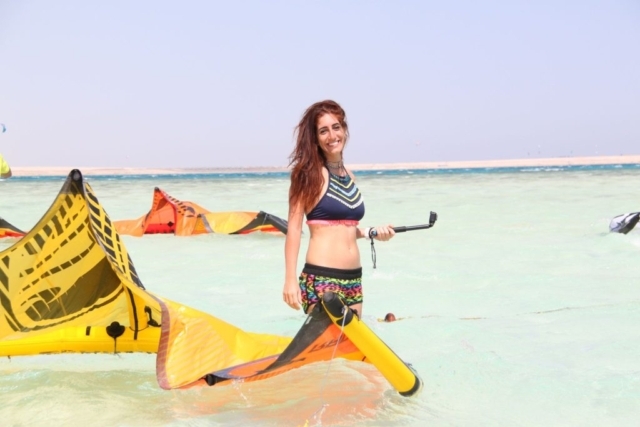 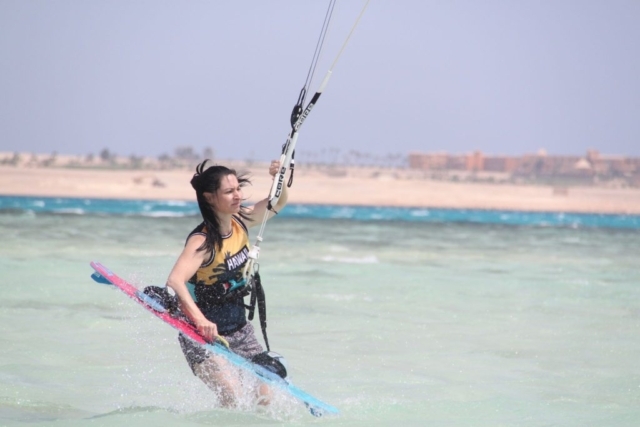 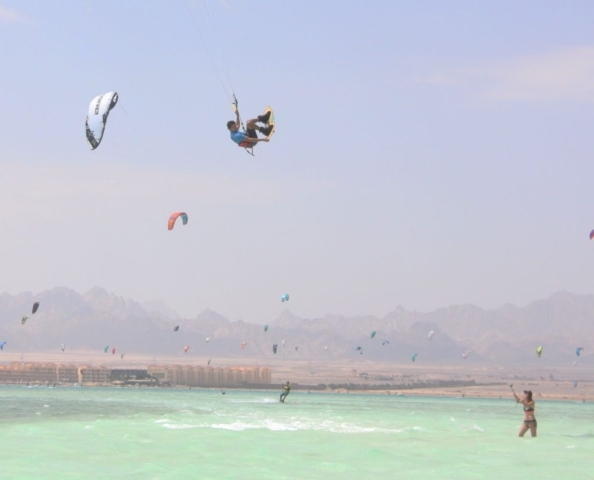 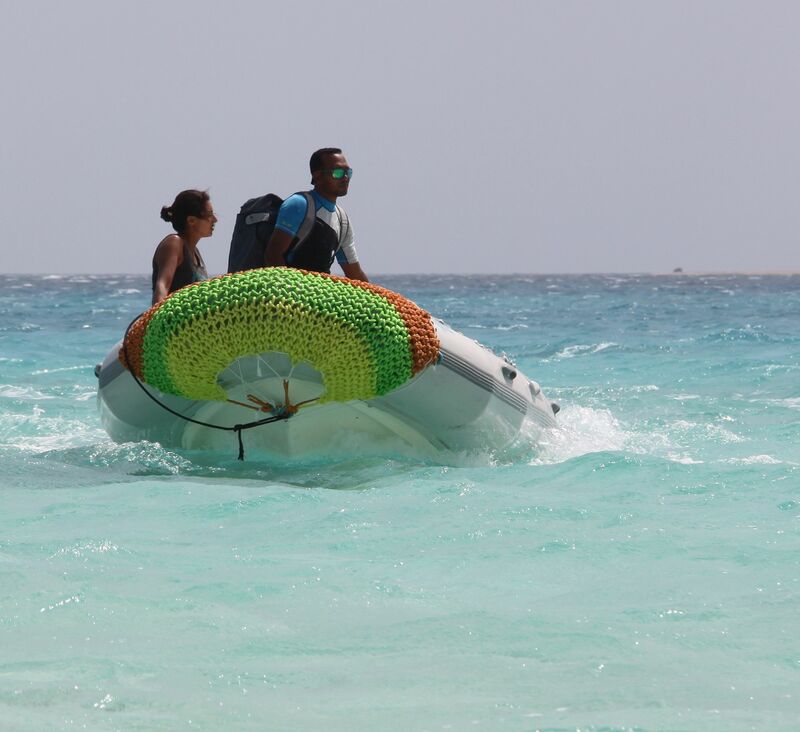 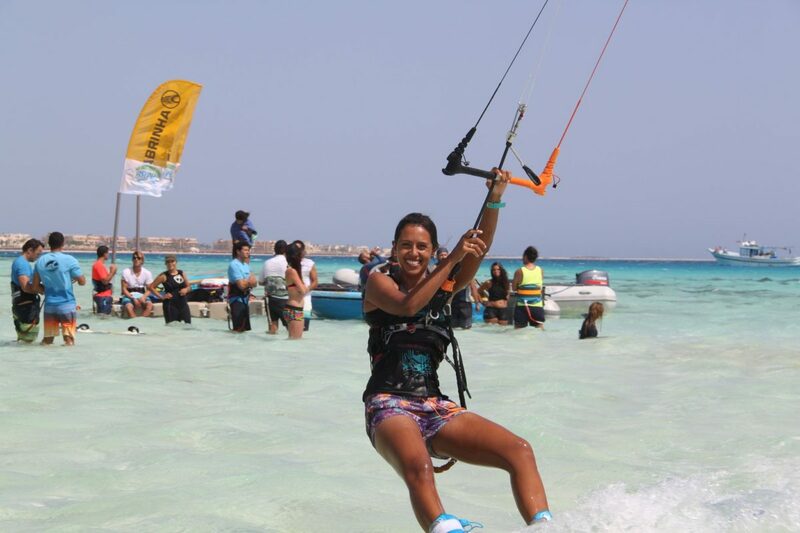 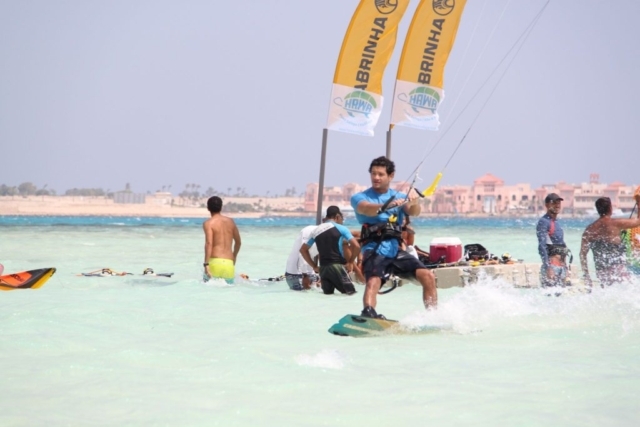 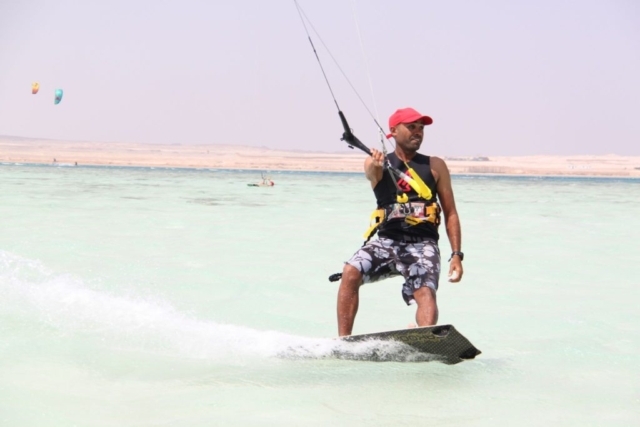 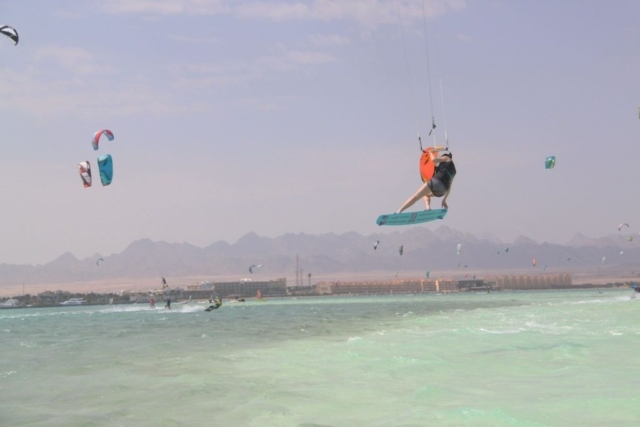 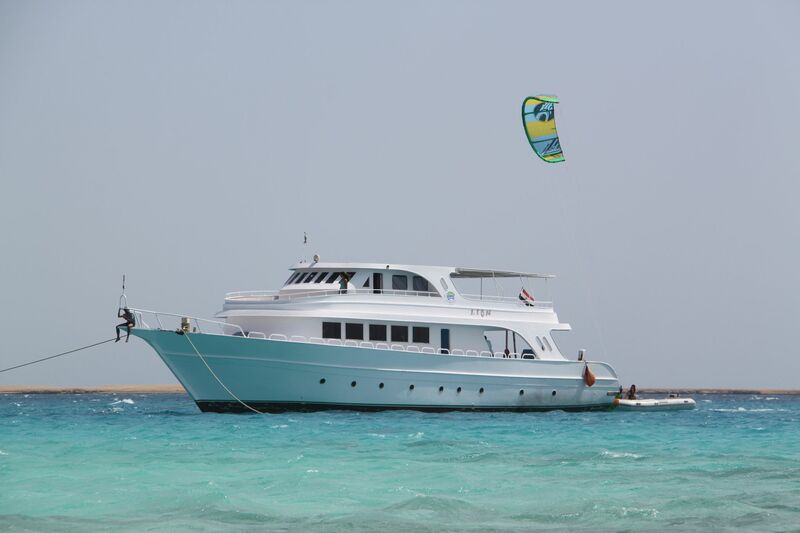 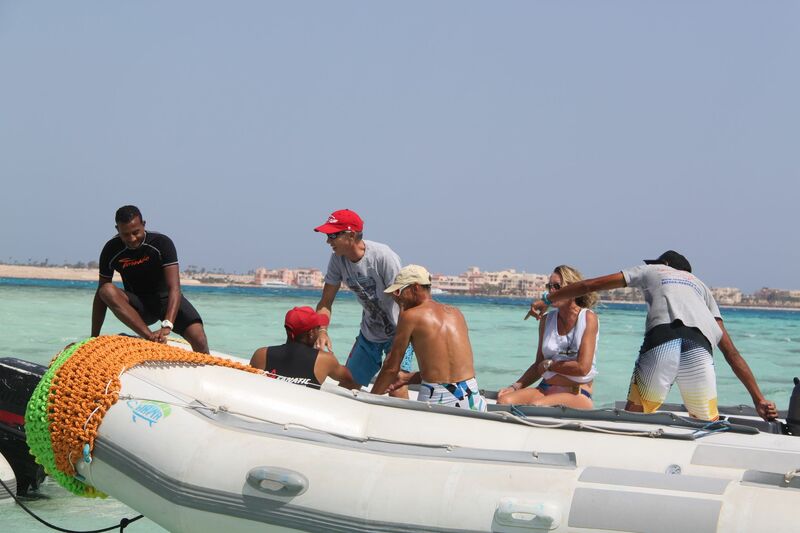 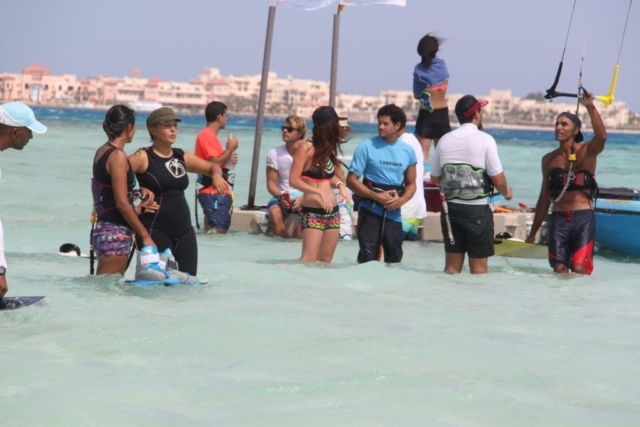 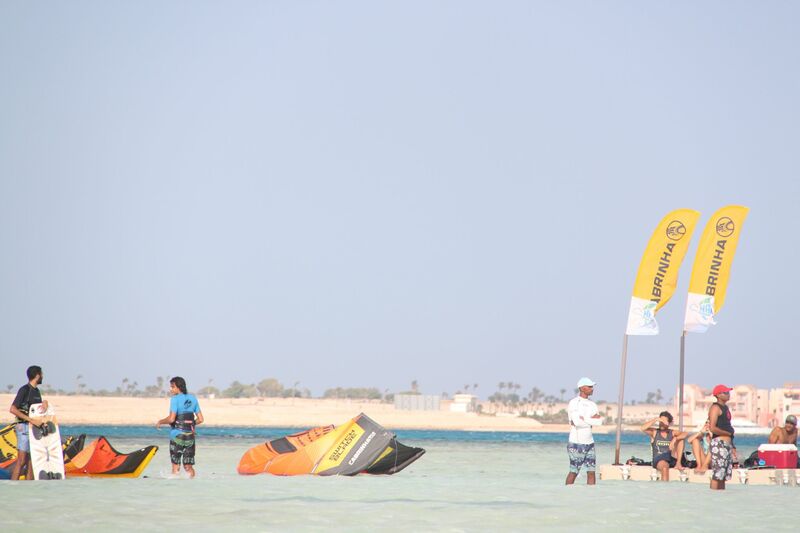 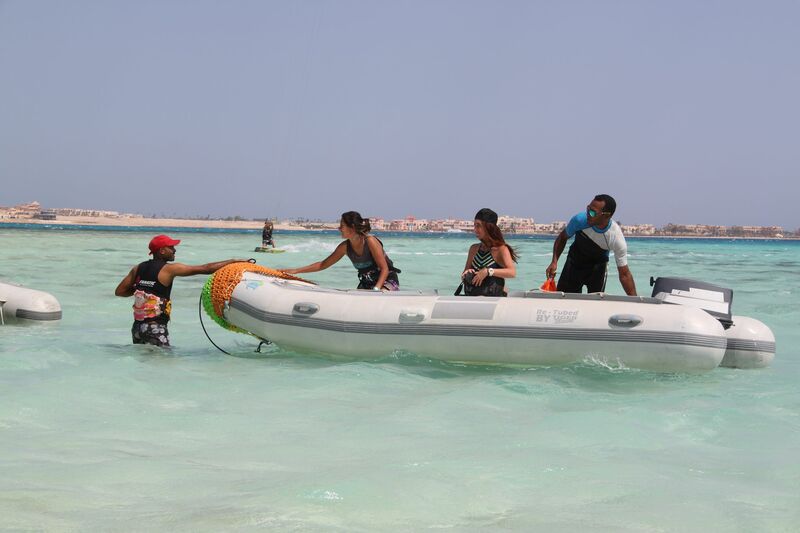 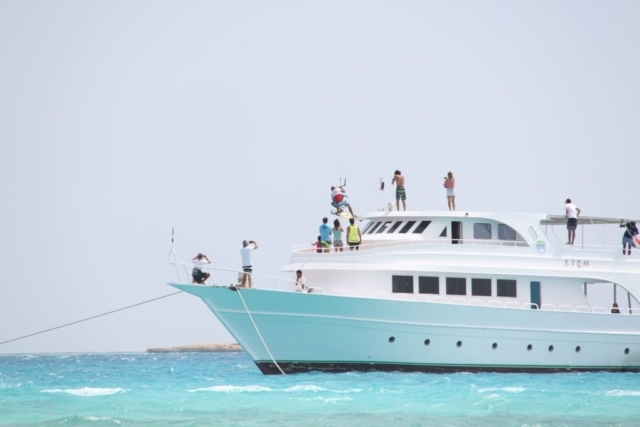 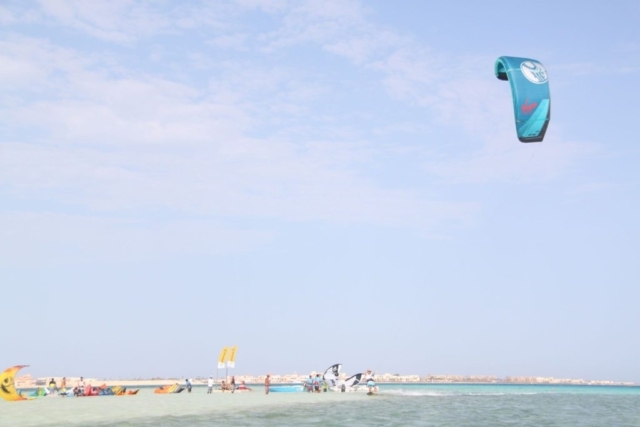 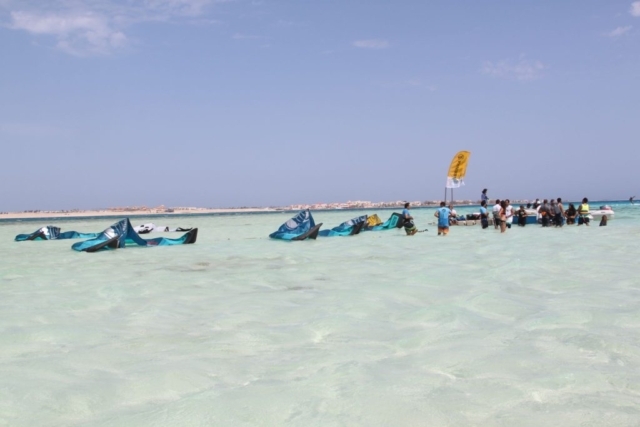 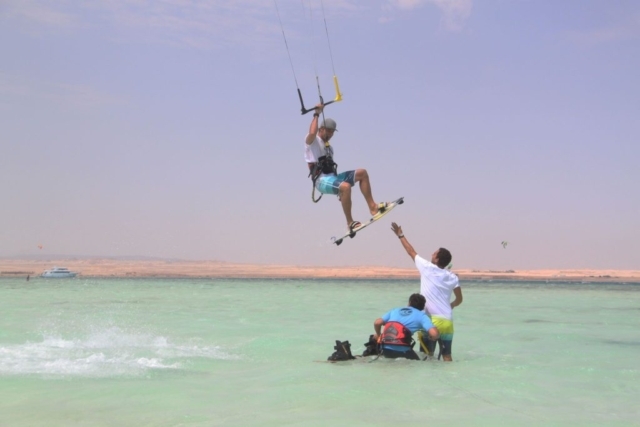 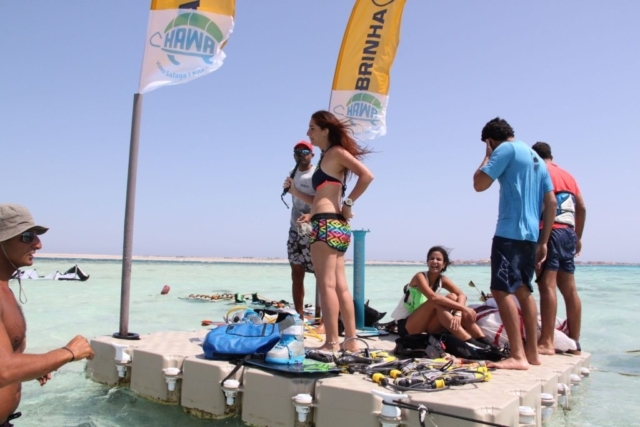 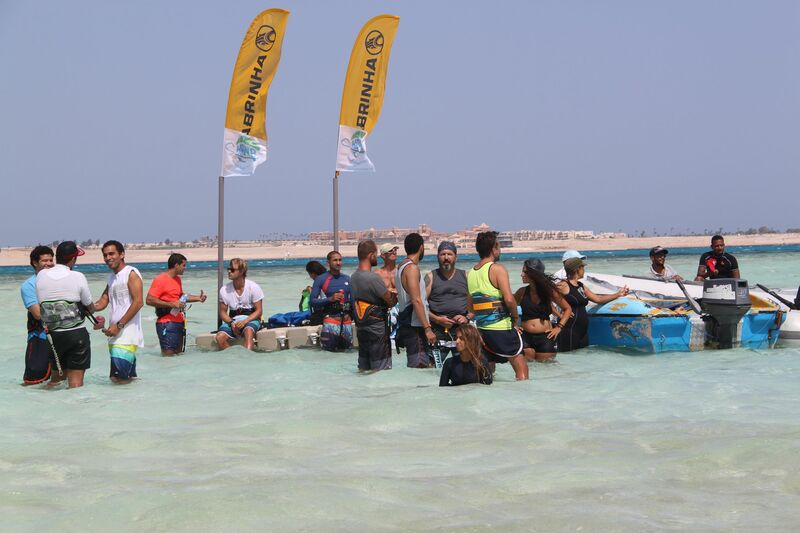 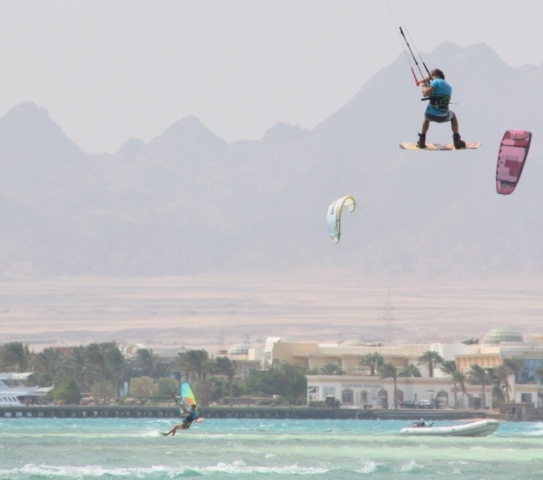 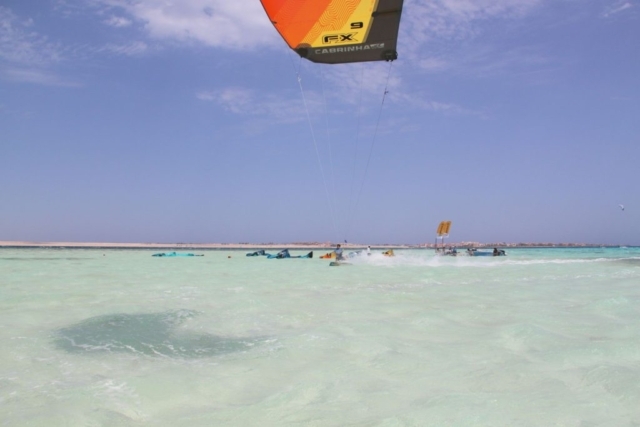 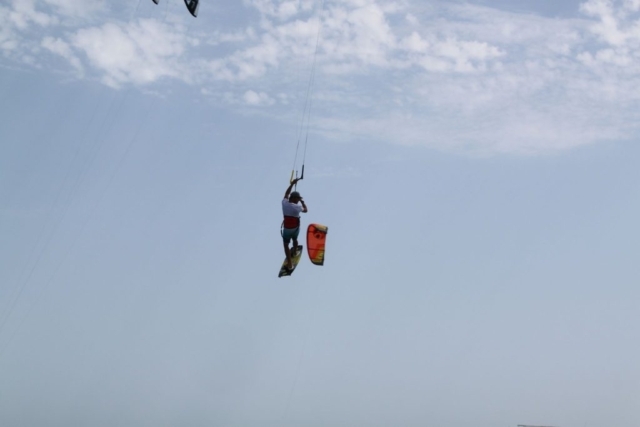 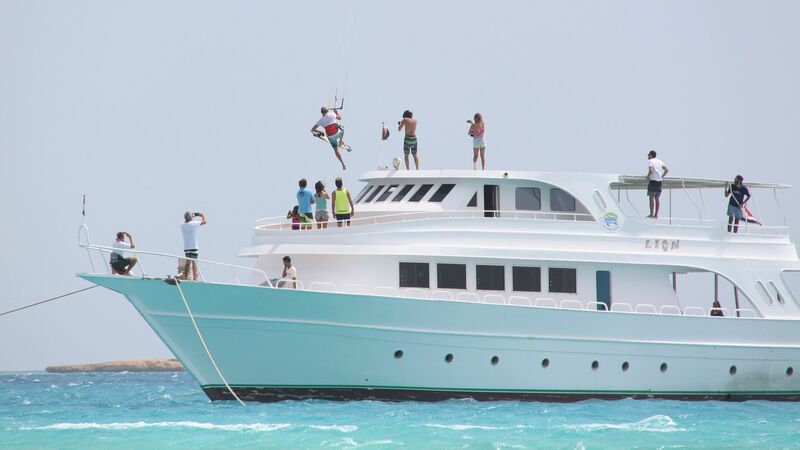 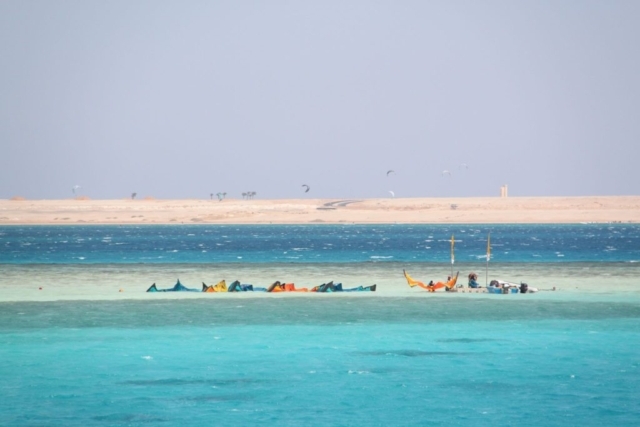 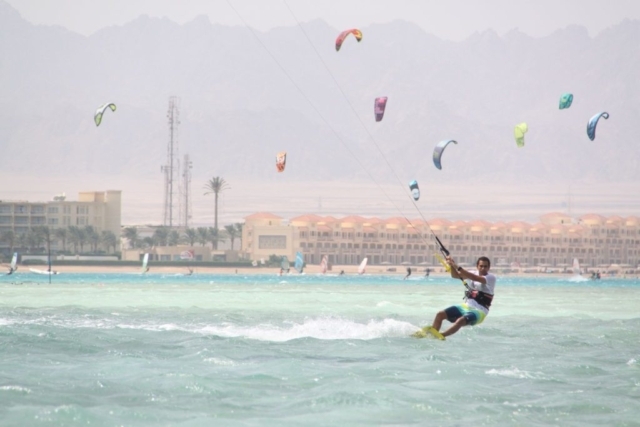 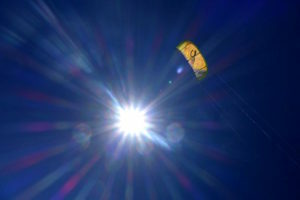 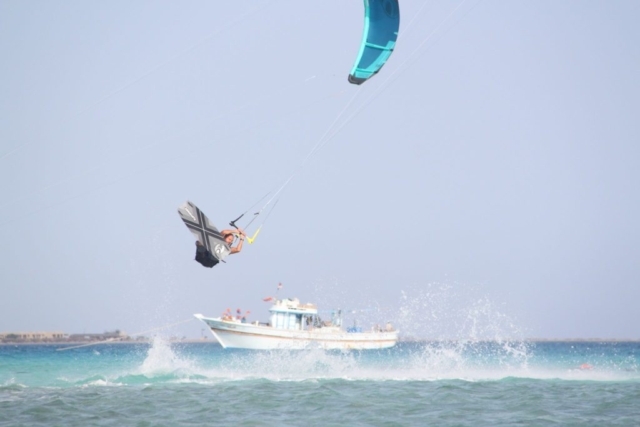 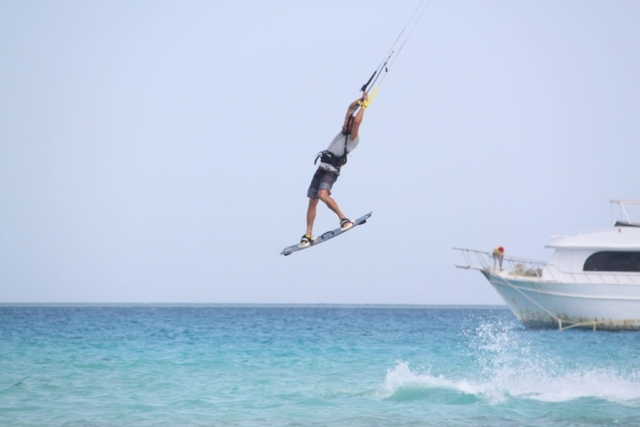 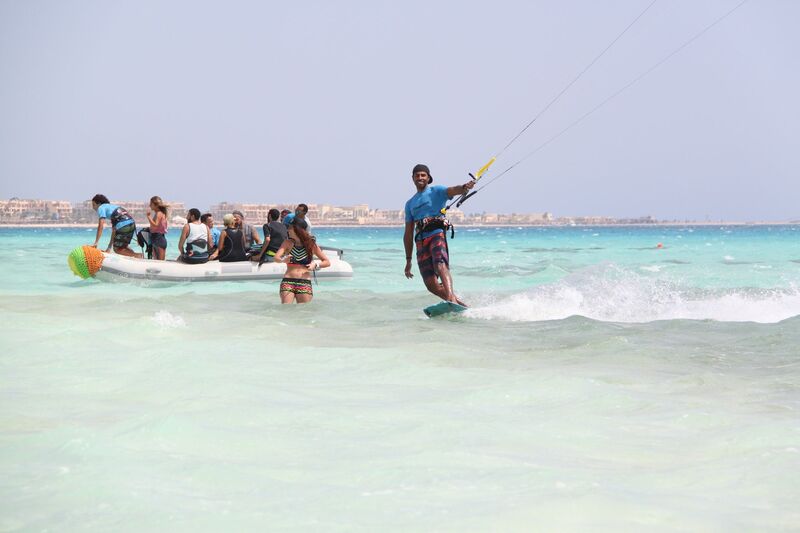 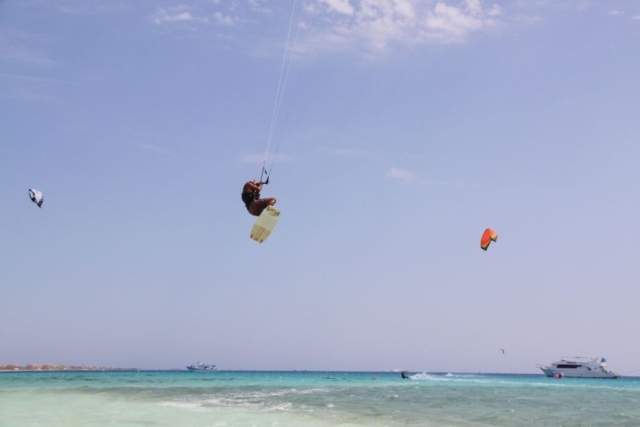 People gathered in the morning at Hawa Station to board the Kite Boat for a 7 km cruise to the station’s main kitesurfing spot “Hawa Platform at Soma Bay”. While Nick, Klaus & David (Cabrinha), Cabrinha Egypt Team, all guests & participants in the Air Style Clinic were enjoying their coffee on the boat, Hawa Staff were preparing the 2018 Cabrinha Gear at the platform to be tested. 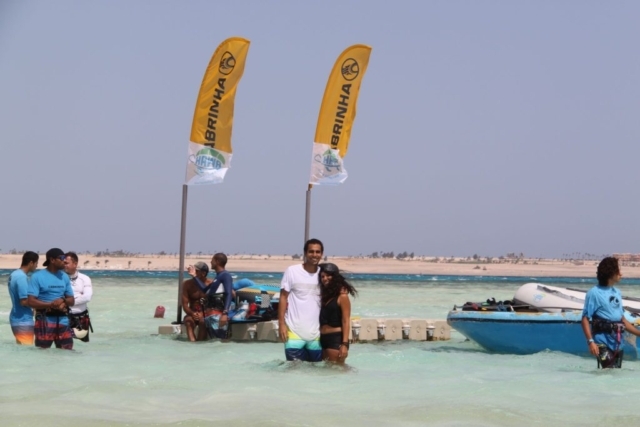 Out in the middle of Soma Bay, surrounded by 360 ° water, a natural fully submerged island creates a perfect wide lagoon with shallow, flat & choppy waters and the surrounding open sea lures every kiter-soul to enjoy the space & the panoramic view of the turquoise water with the mountains in the background. That’s where the “Hawa Platform” is located; a floating island fixed at the edge of the submerged island, to have the open water on one side and the lagoon with crystal clear, flat water on the other. The set-up is fast & different. 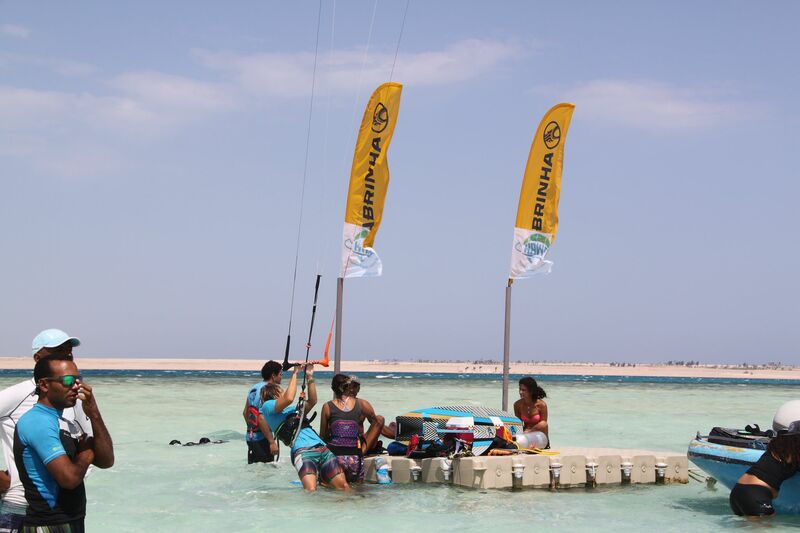 The kites are being inflated with air tanks on the platform, they are being hooked to the fixed ropes in the water & as a rider all you have to do, is holding your bar while an assistant untwists the lines and connects them to your kite –Are you ready?! 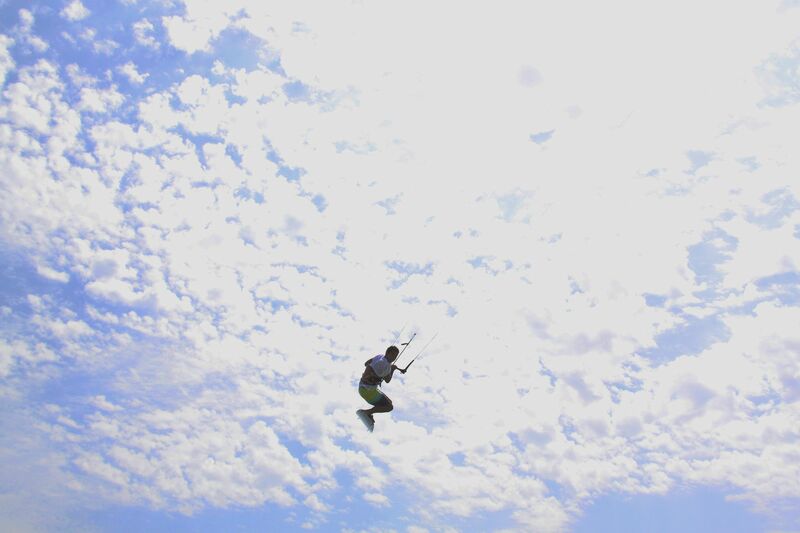 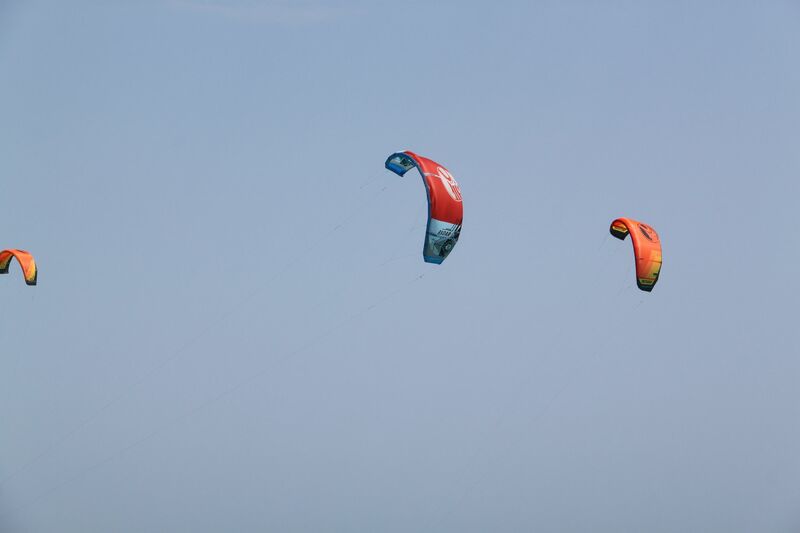 Launch, Kite & Enjoy! 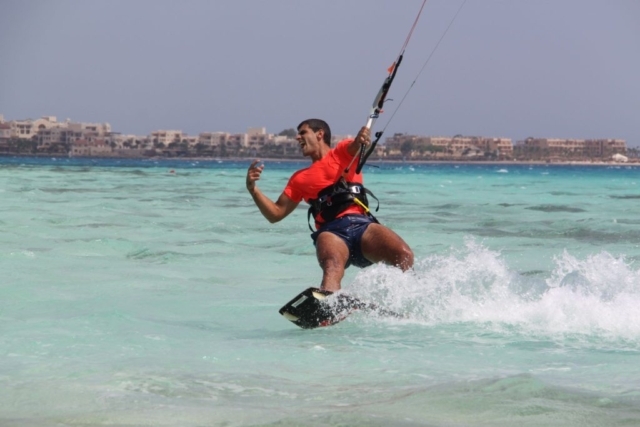 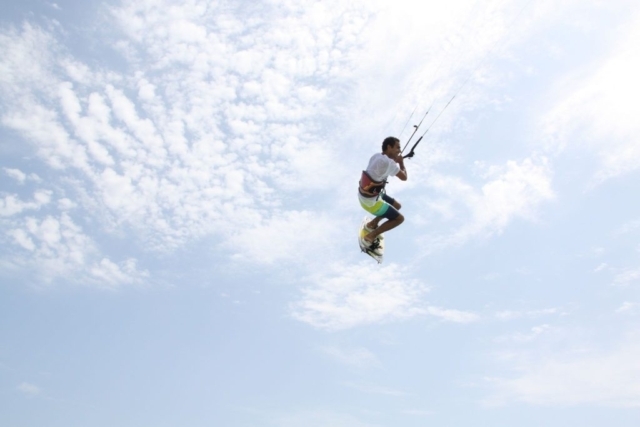 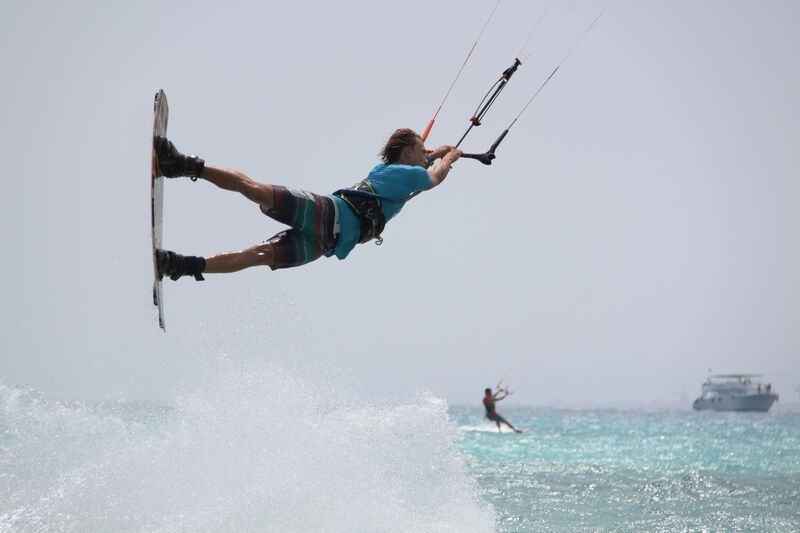 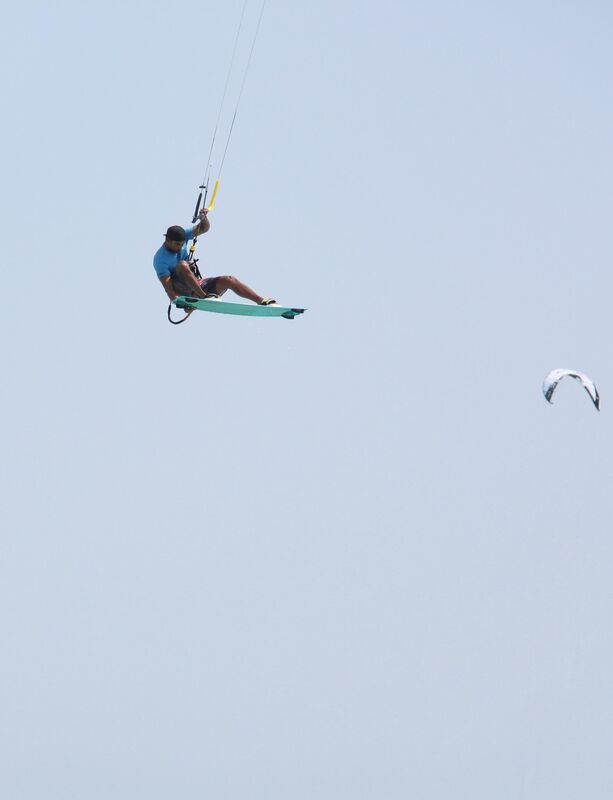 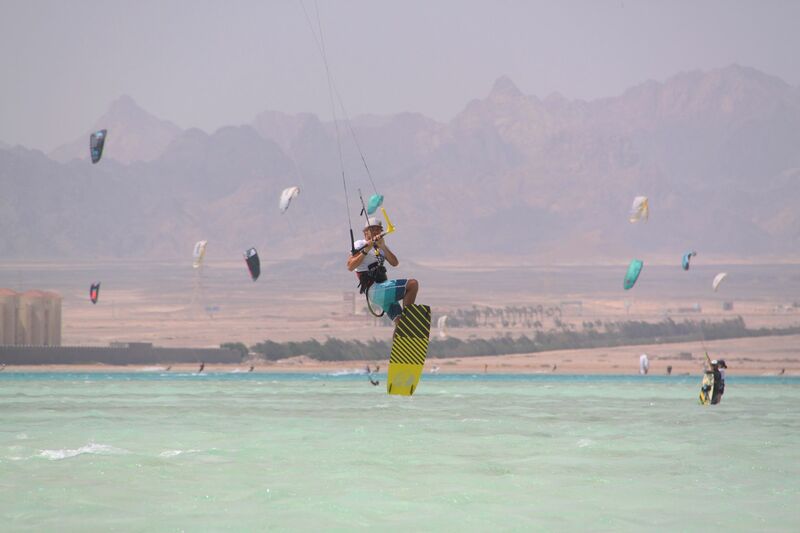 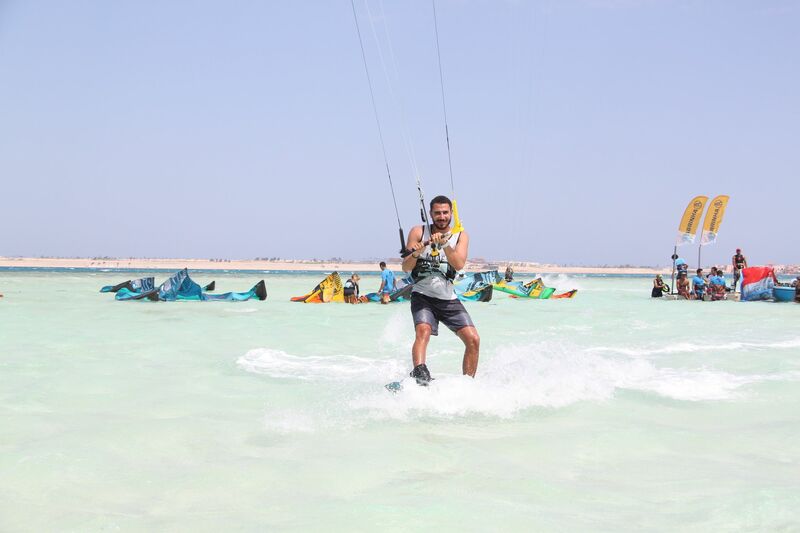 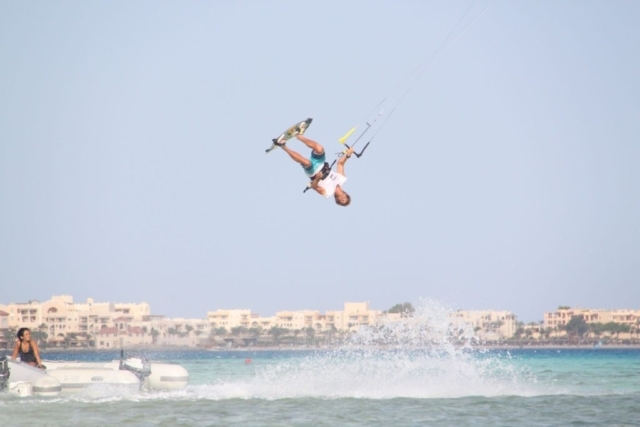 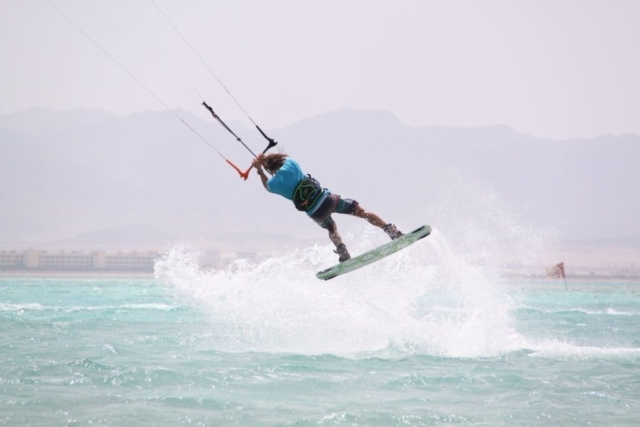 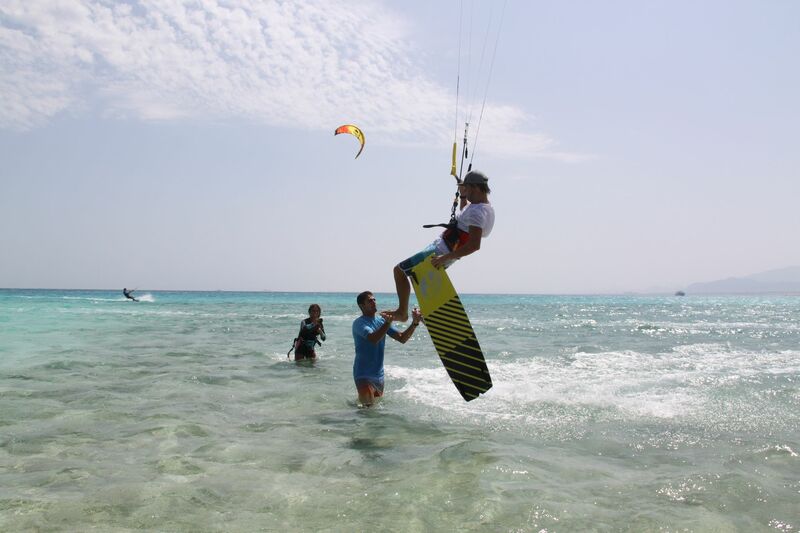 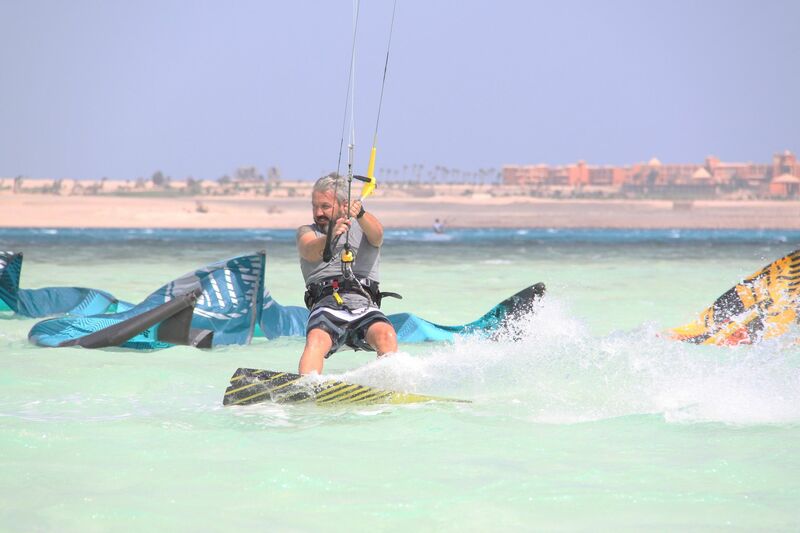 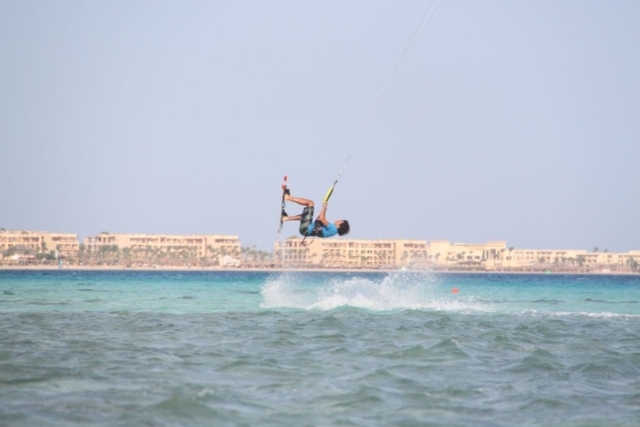 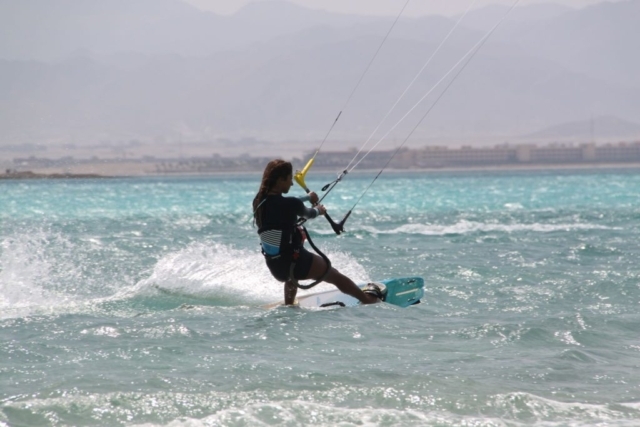 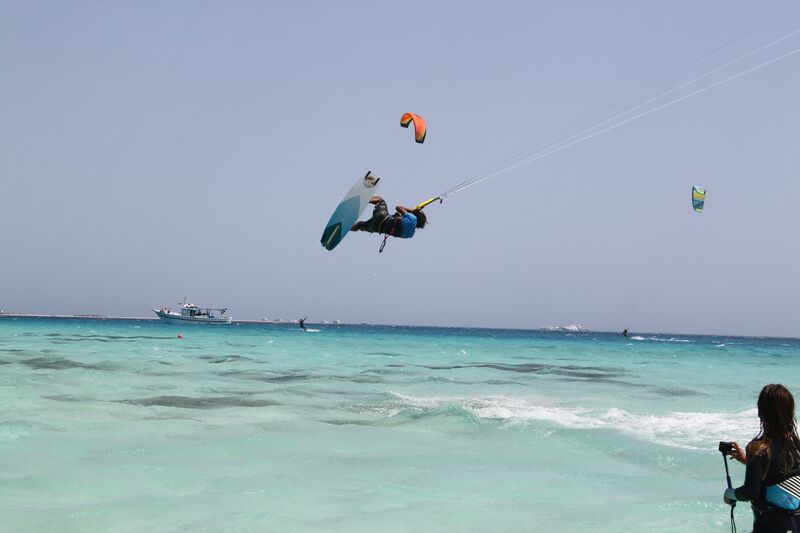 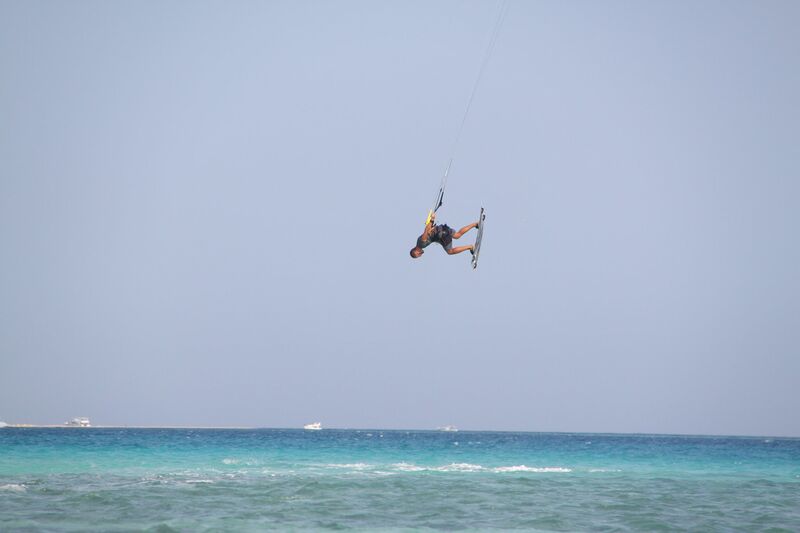 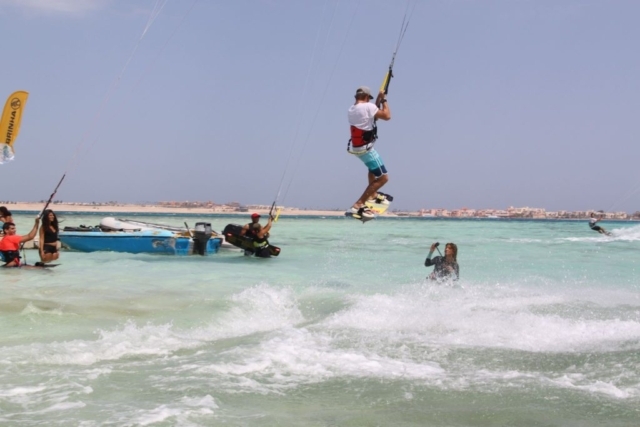 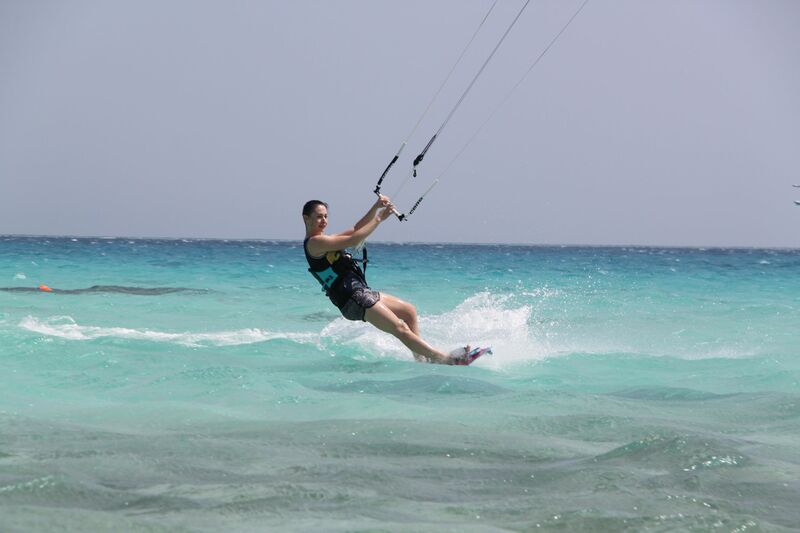 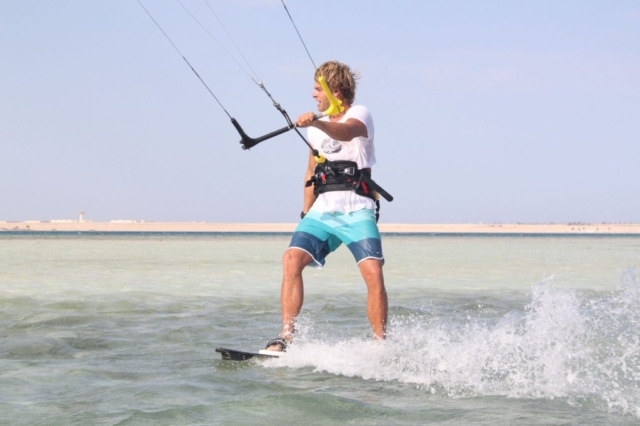 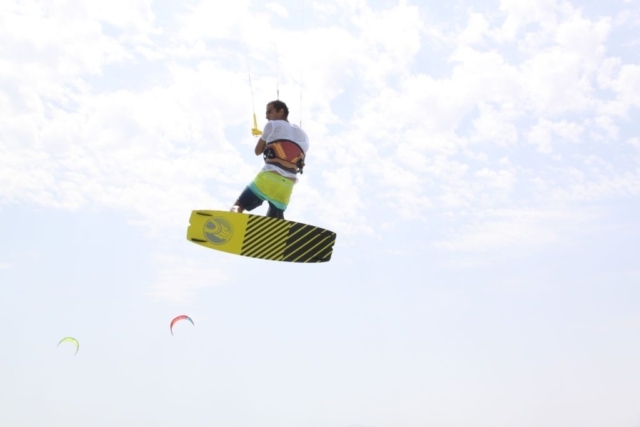 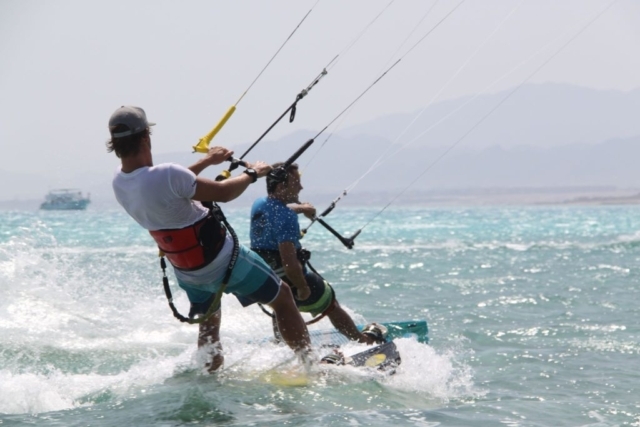 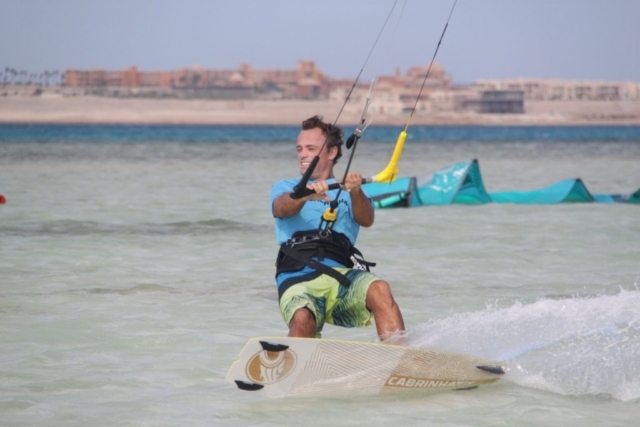 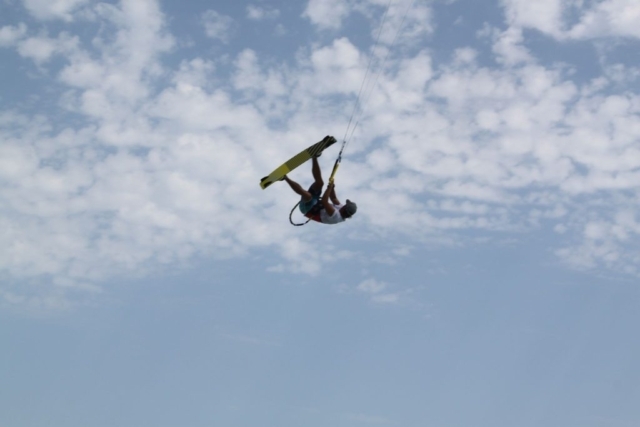 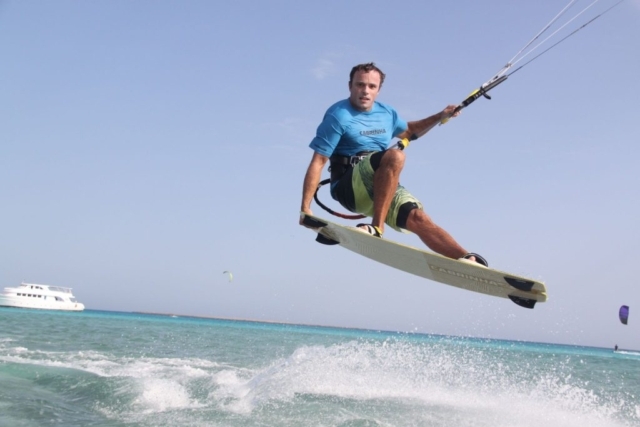 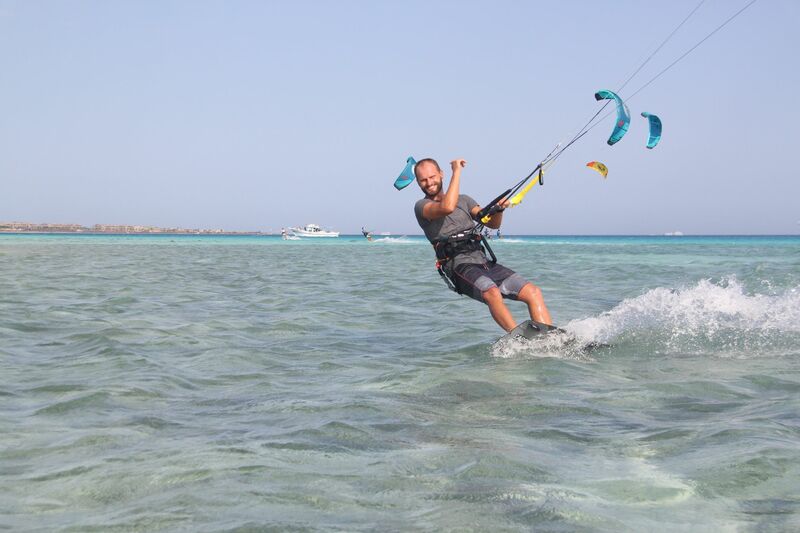 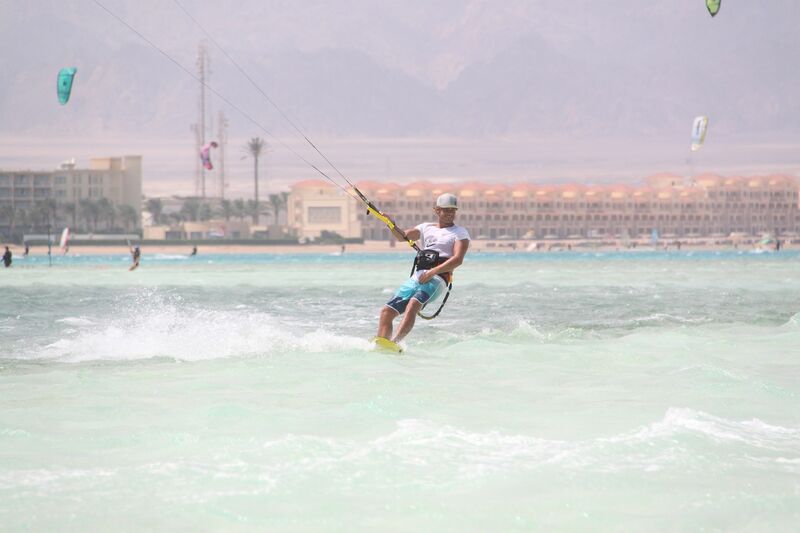 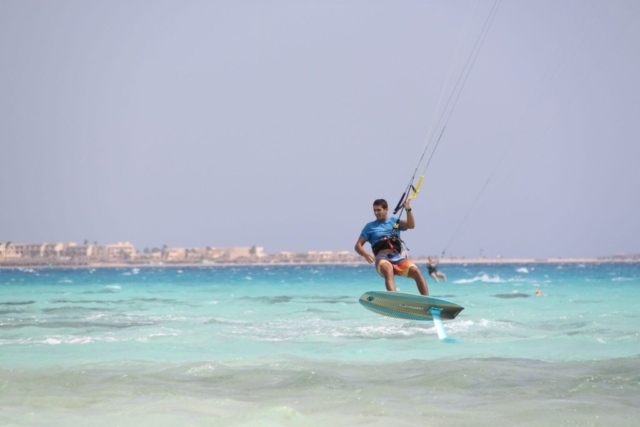 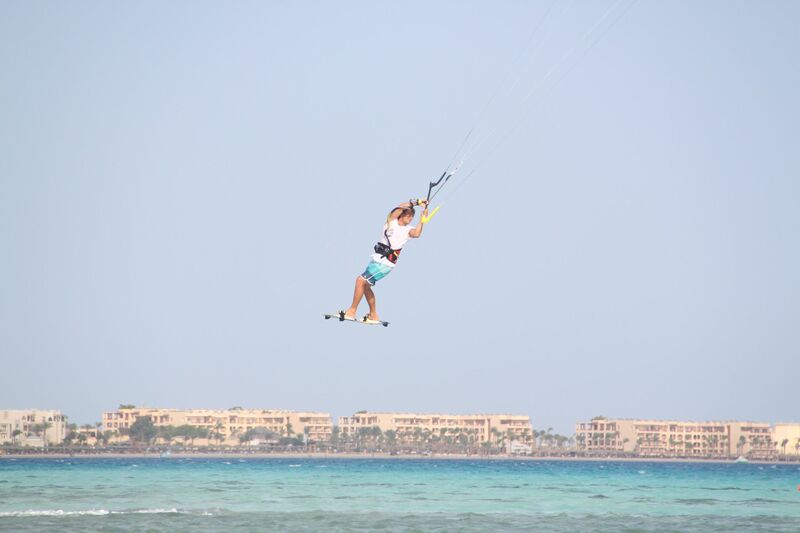 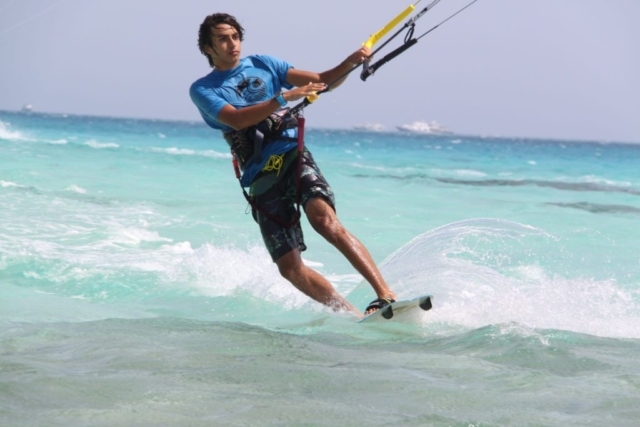 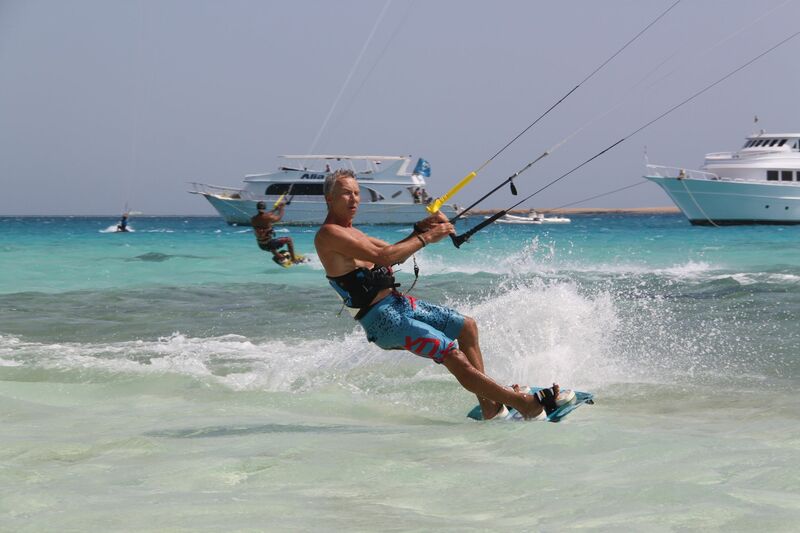 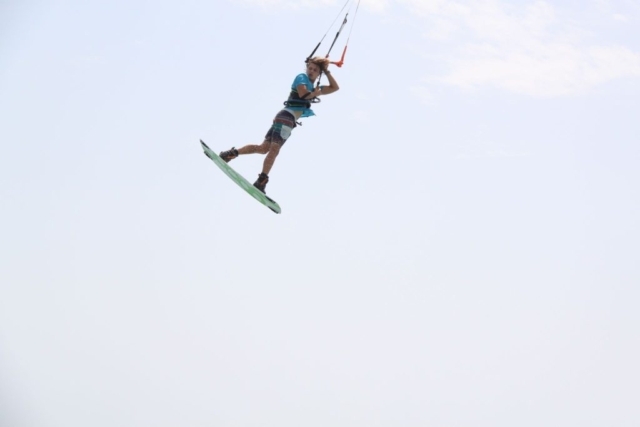 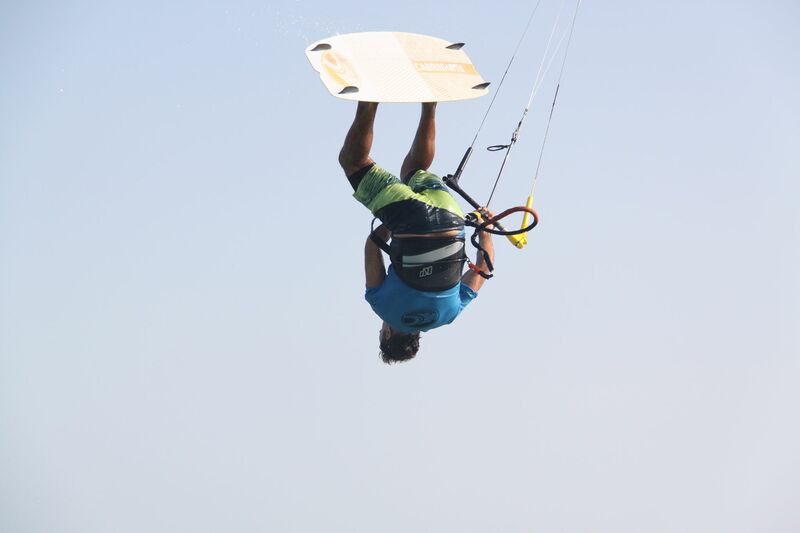 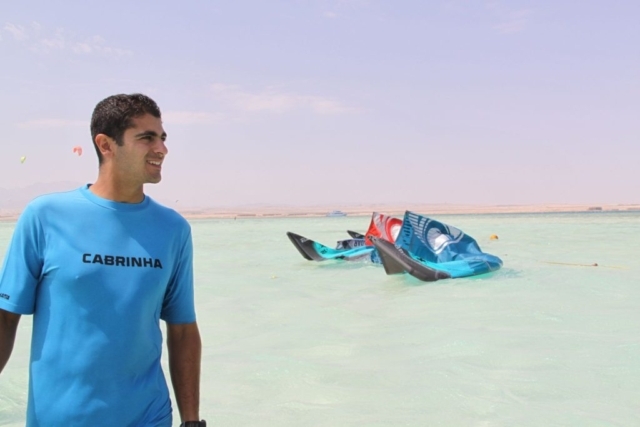 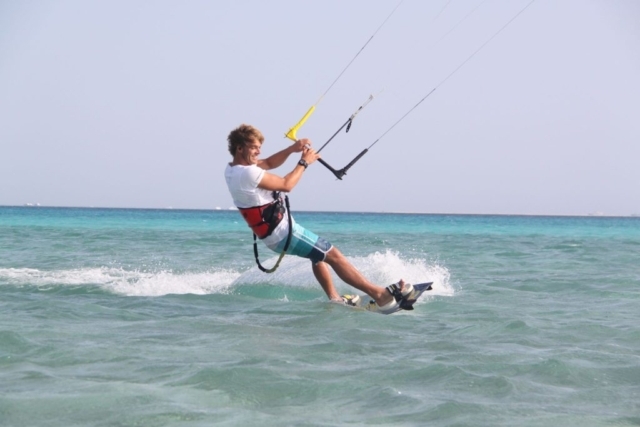 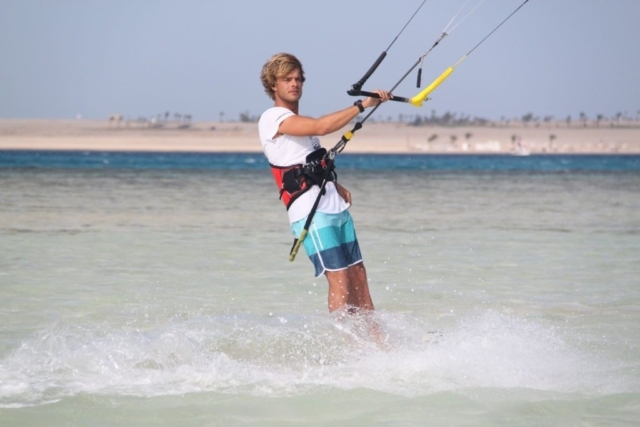 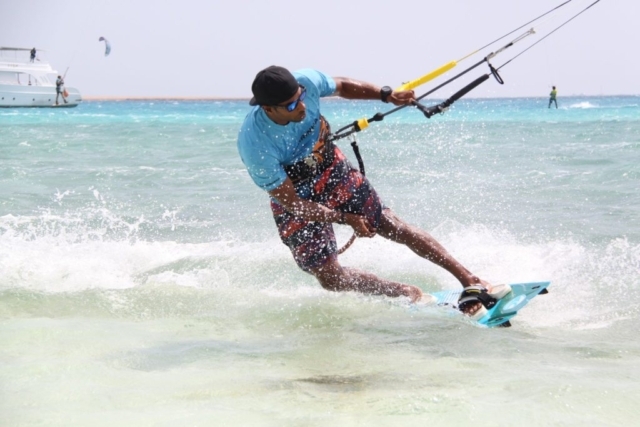 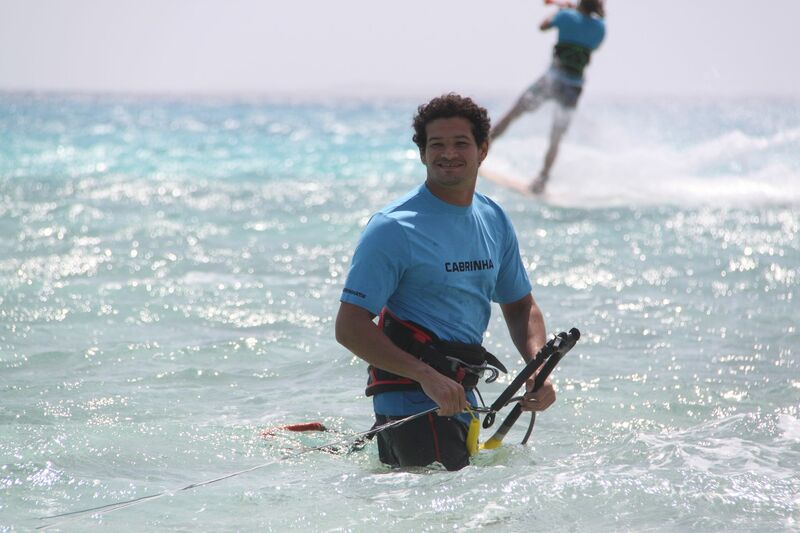 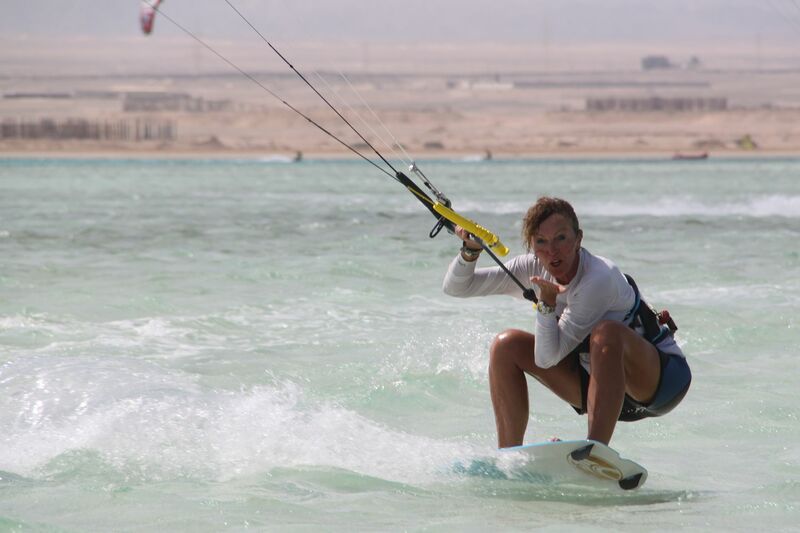 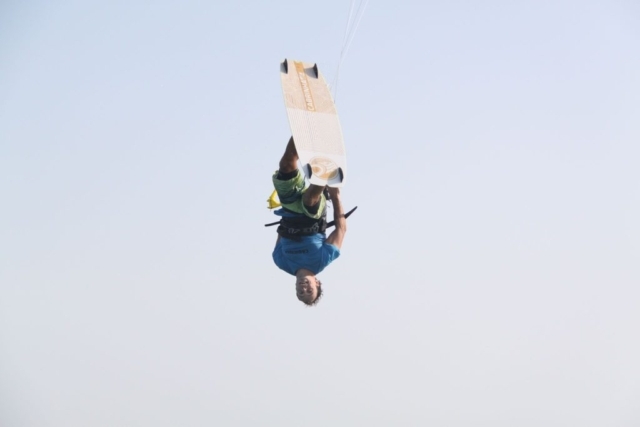 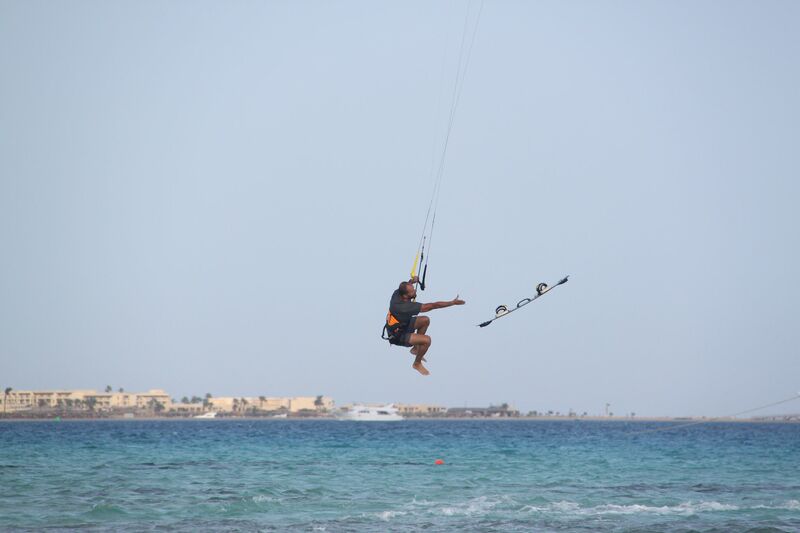 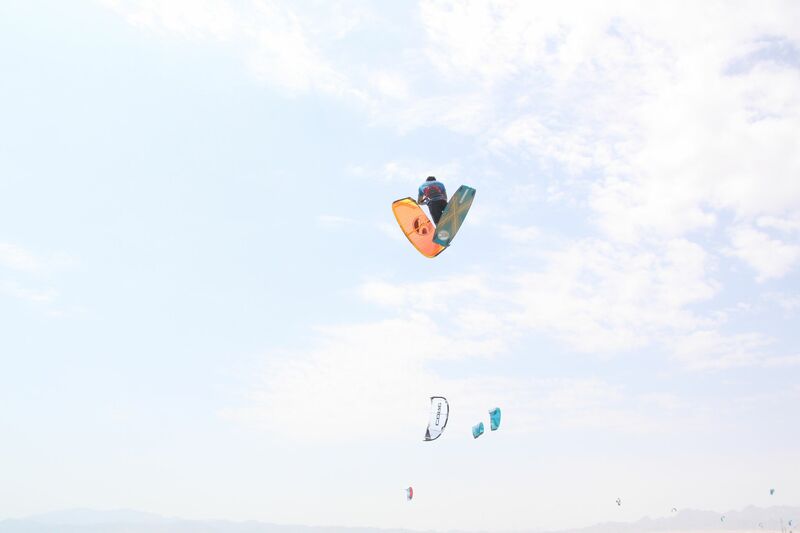 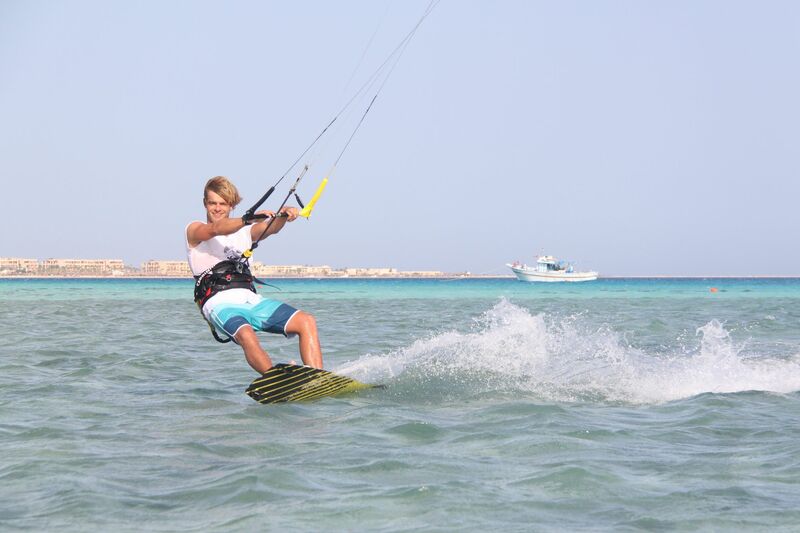 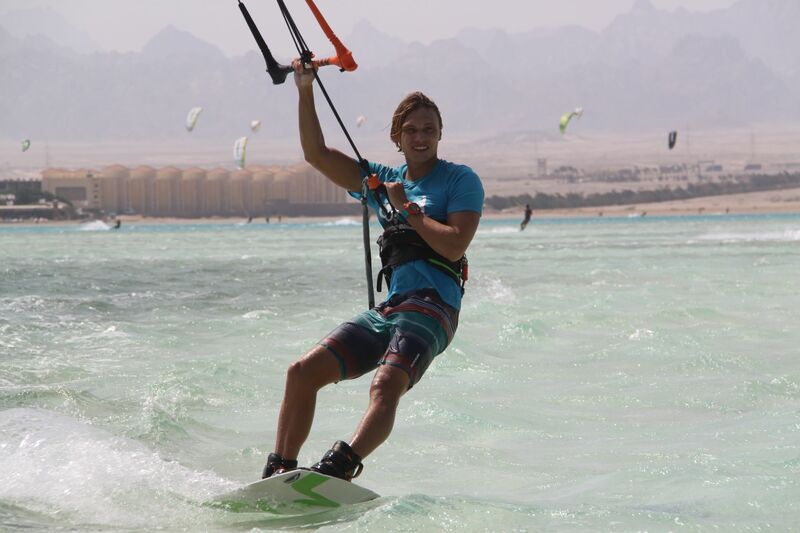 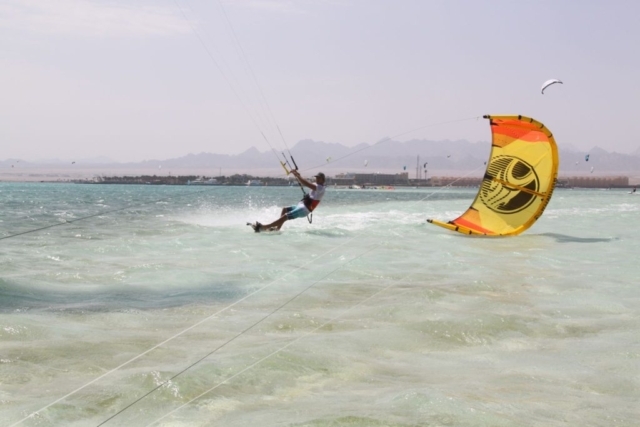 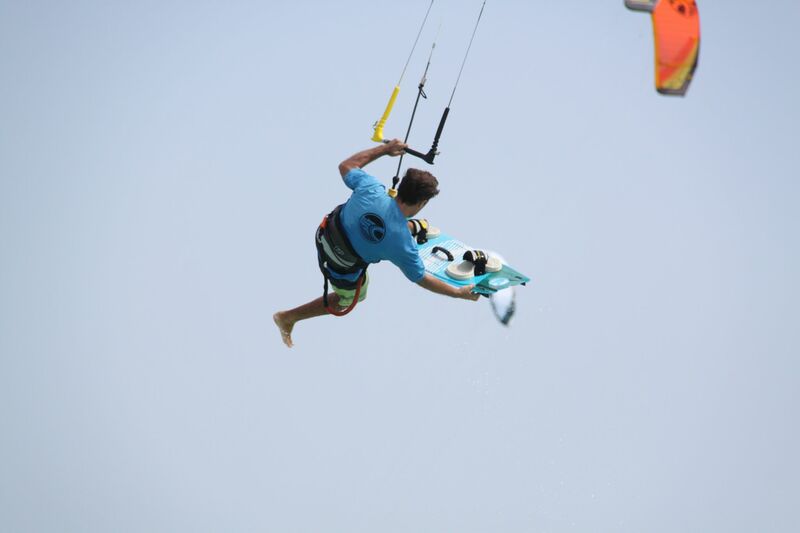 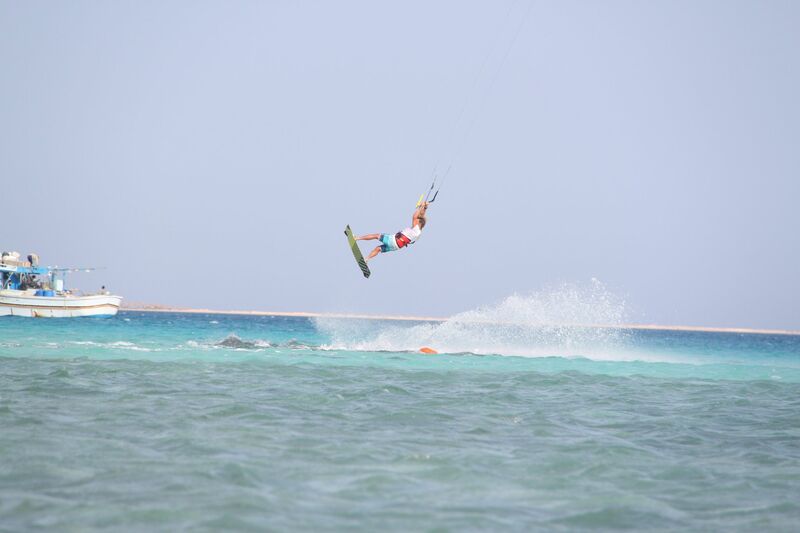 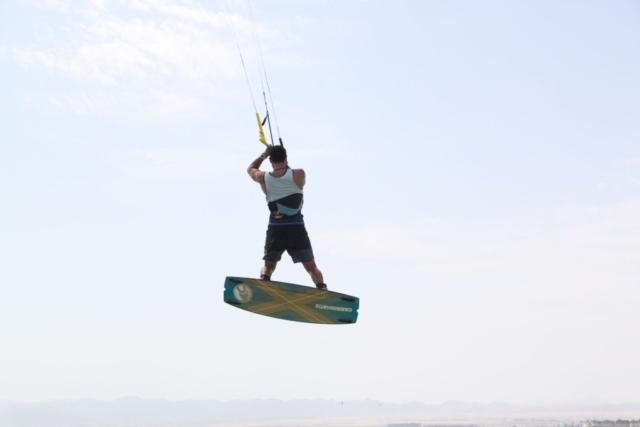 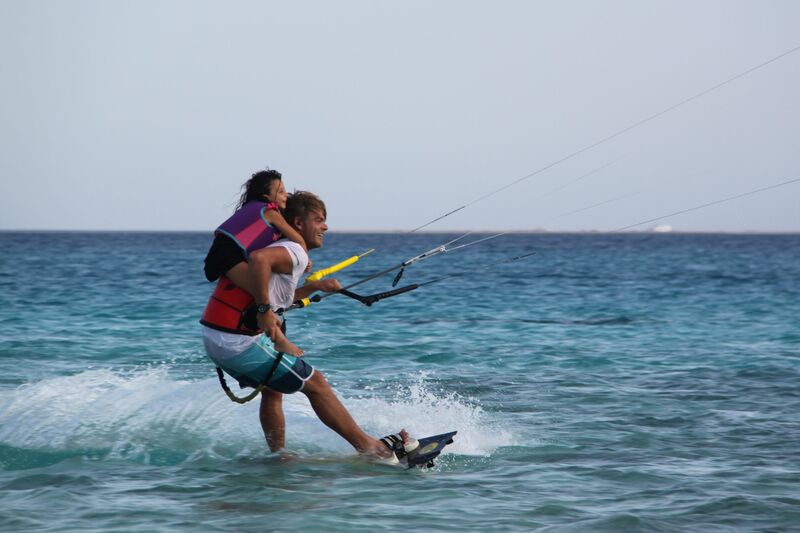 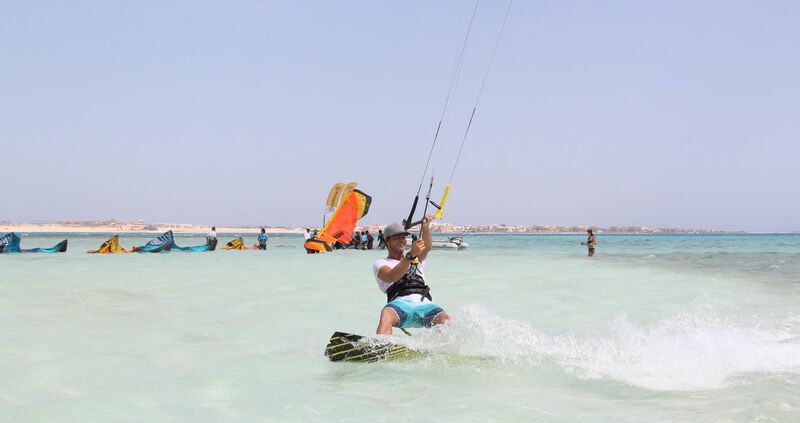 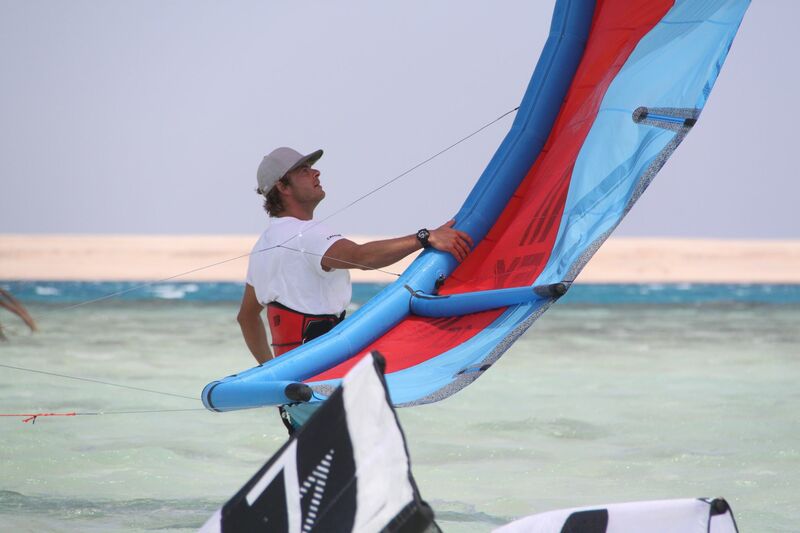 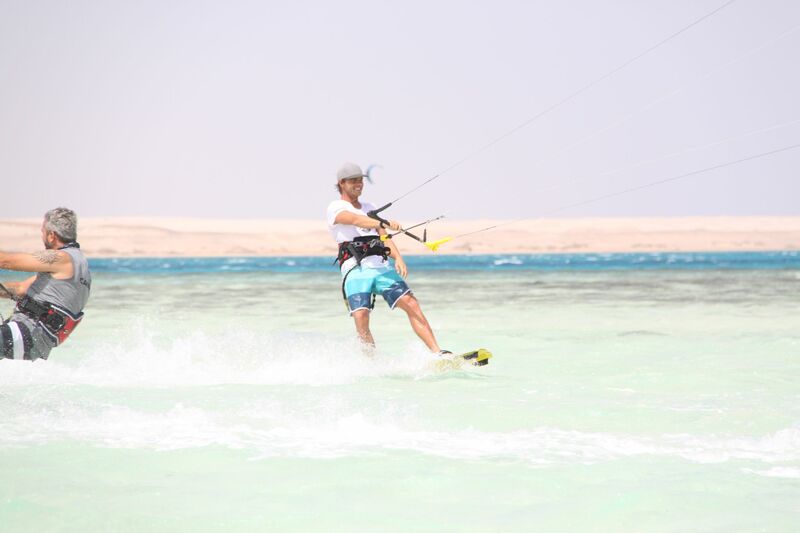 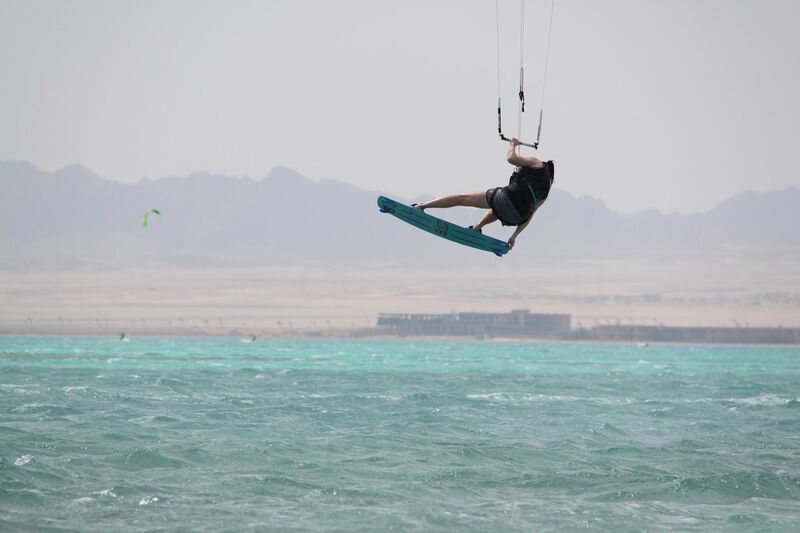 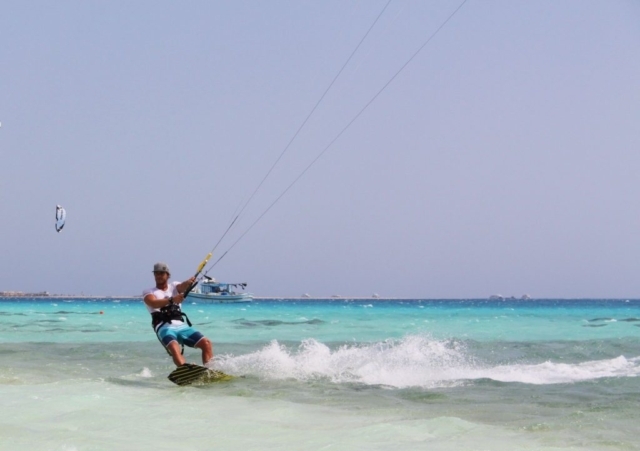 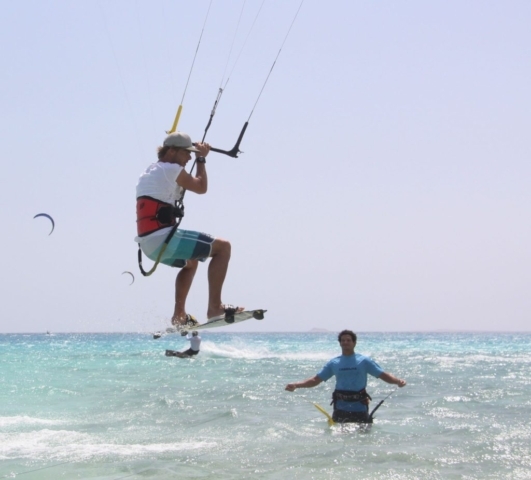 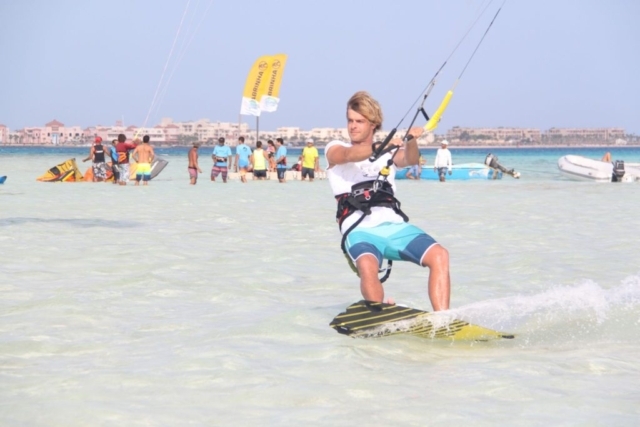 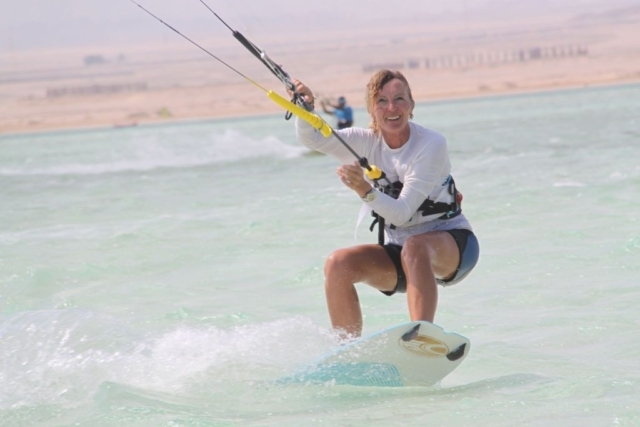 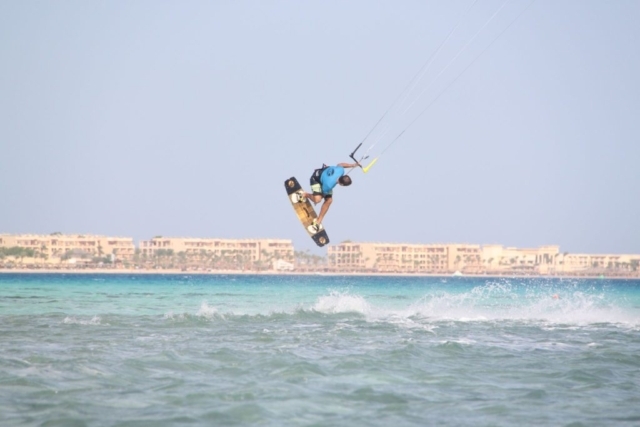 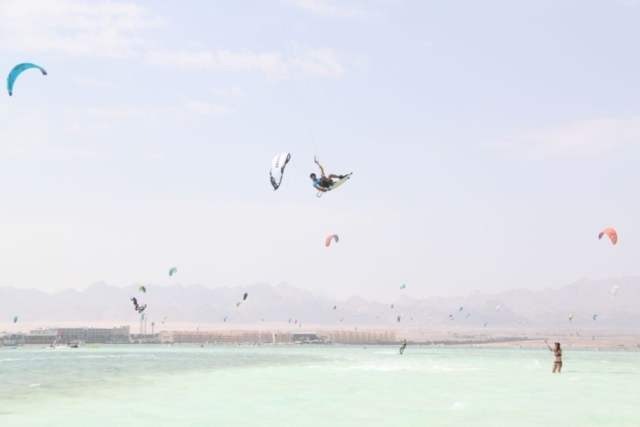 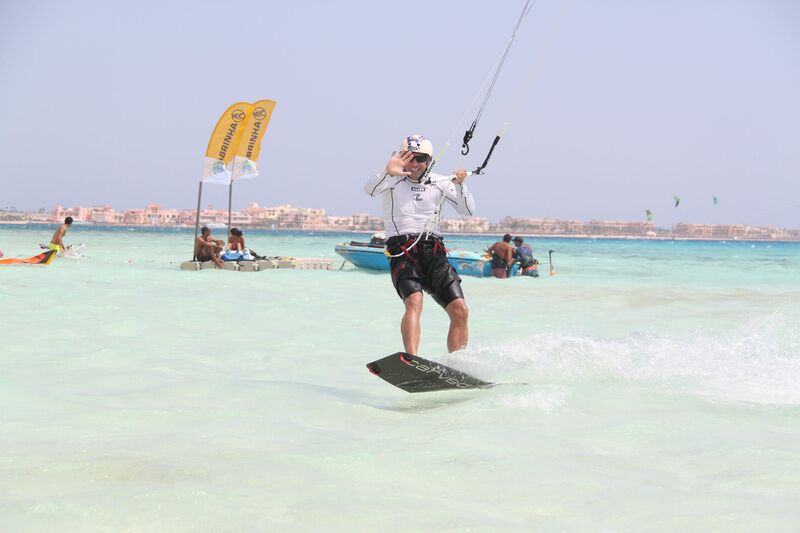 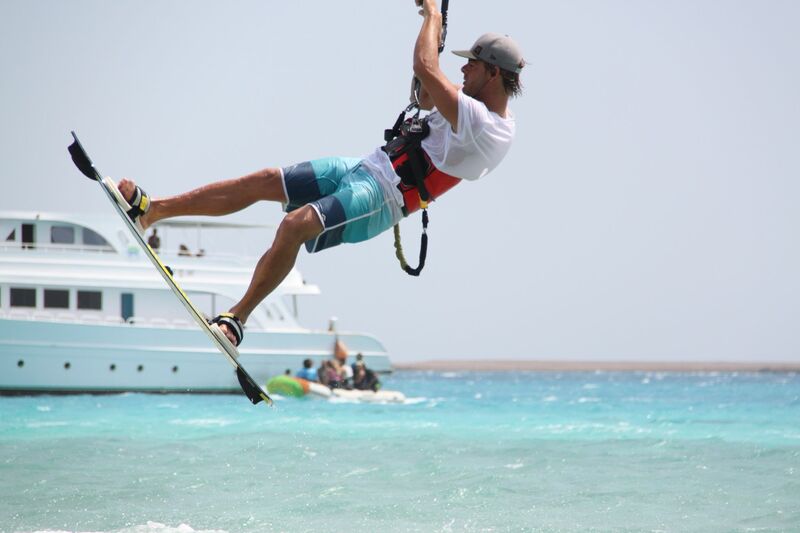 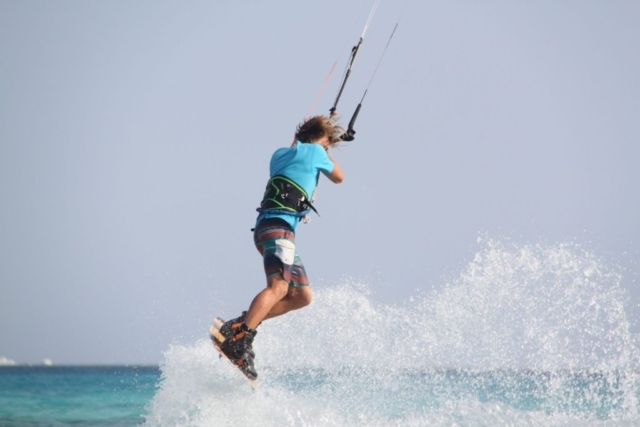 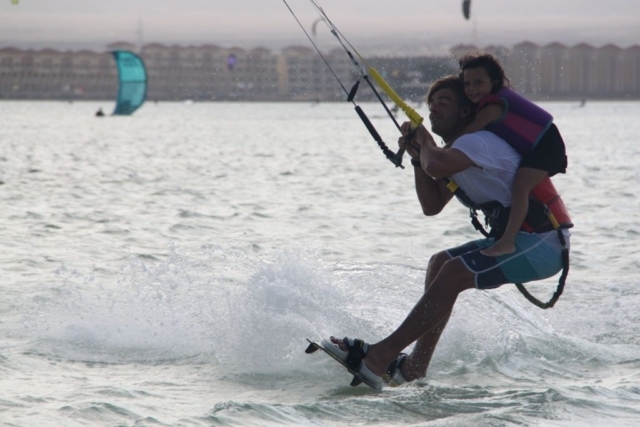 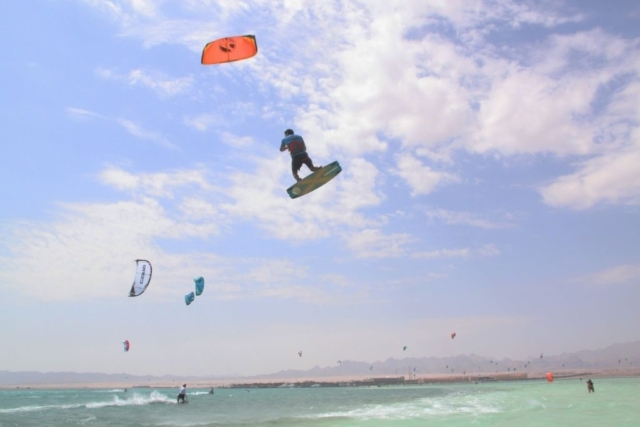 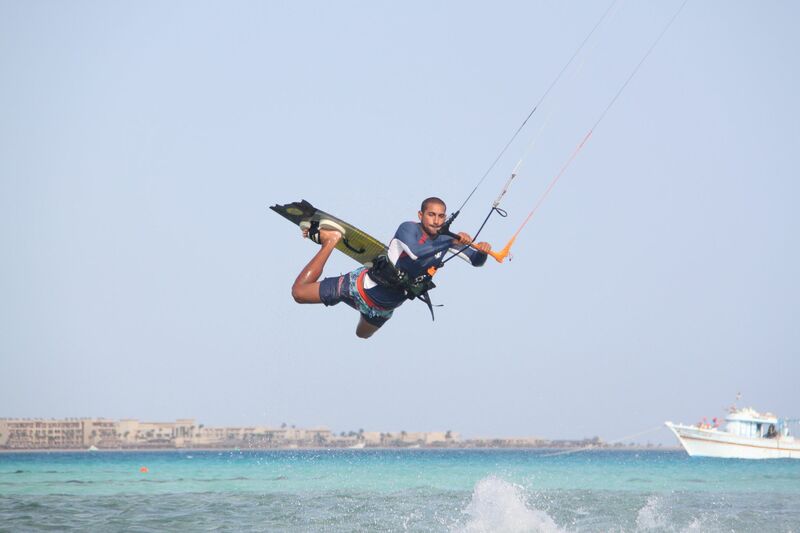 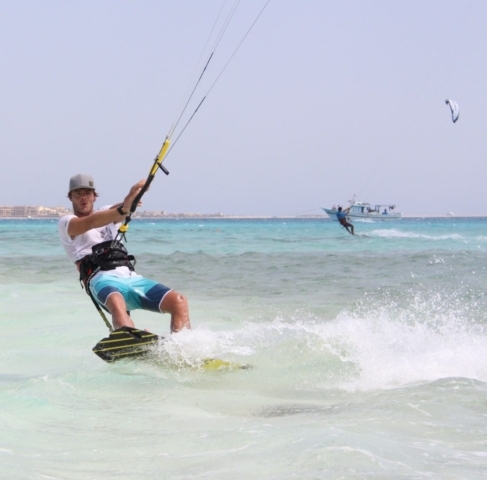 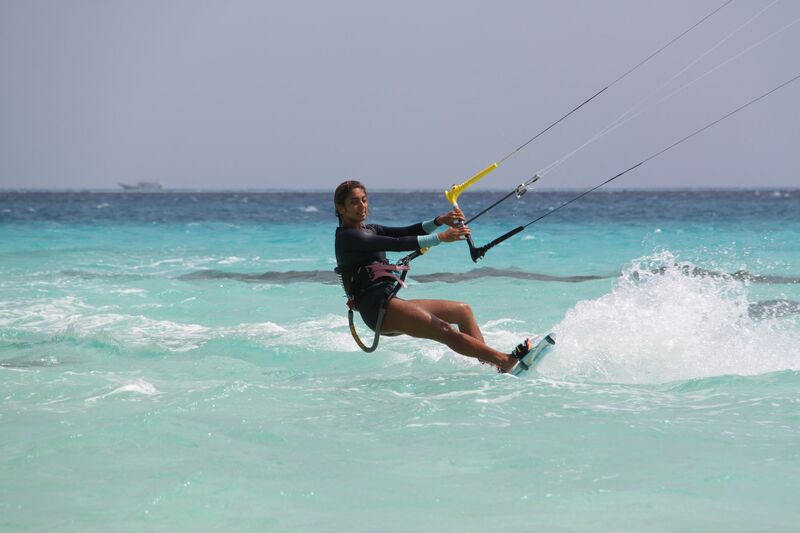 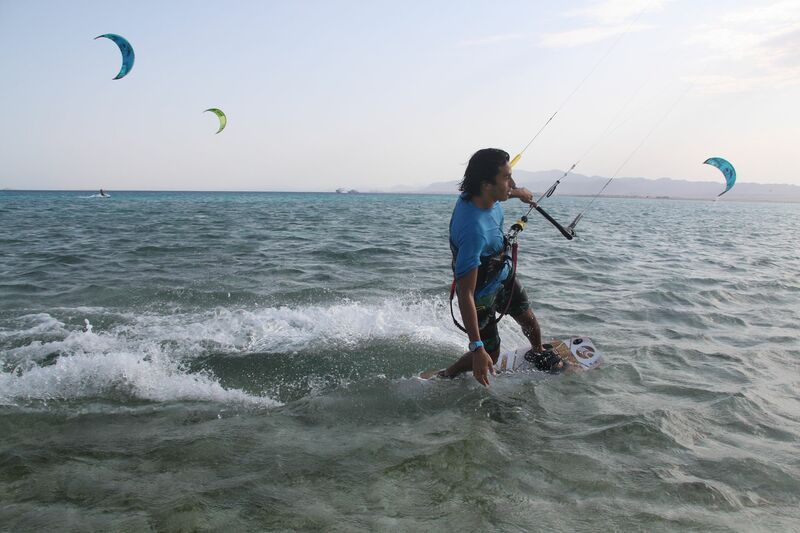 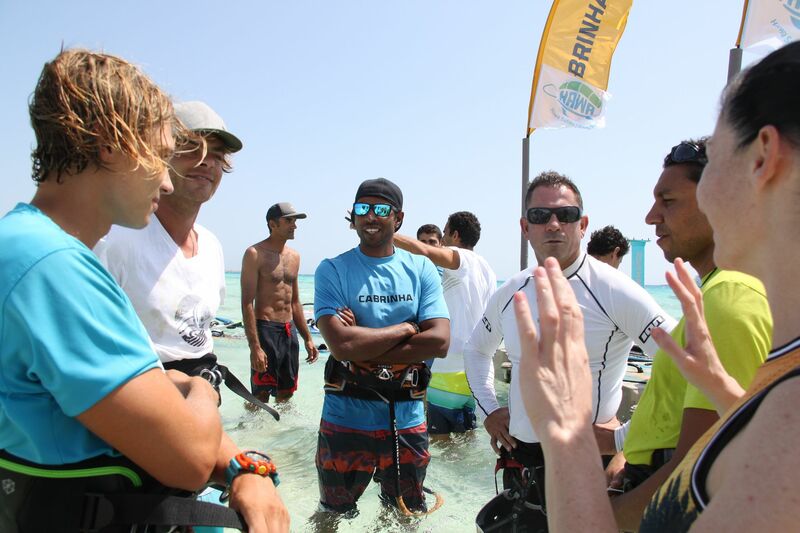 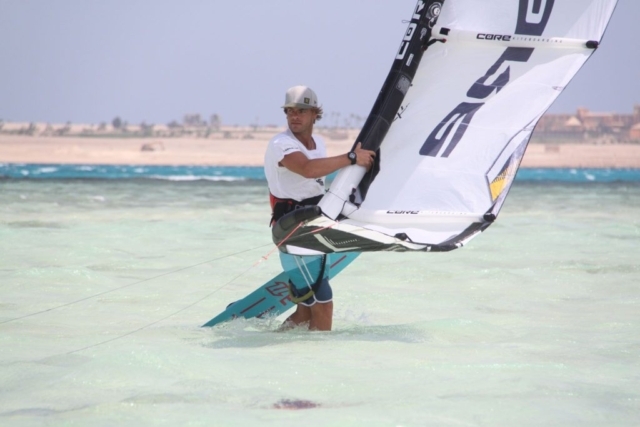 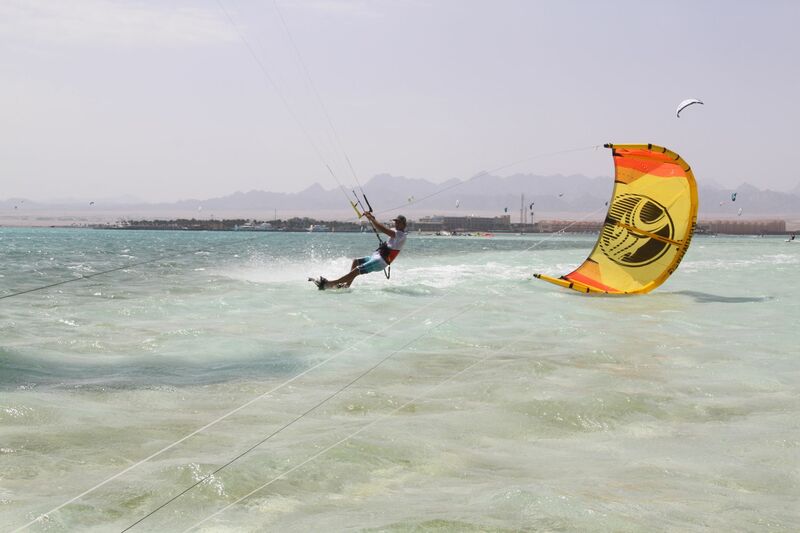 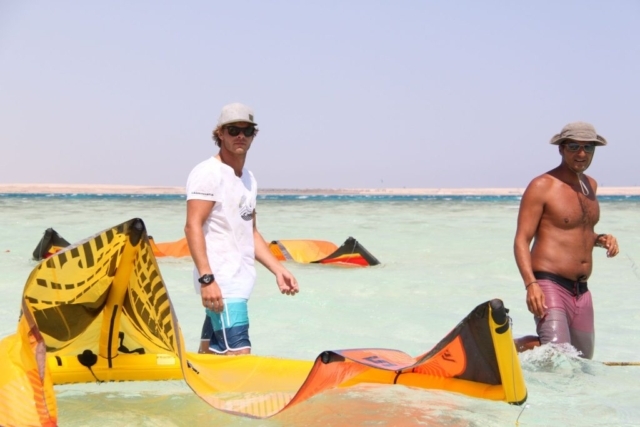 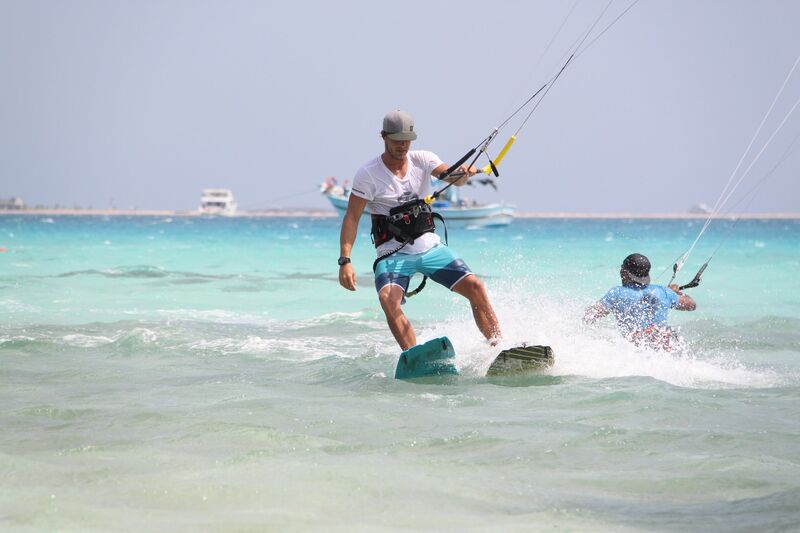 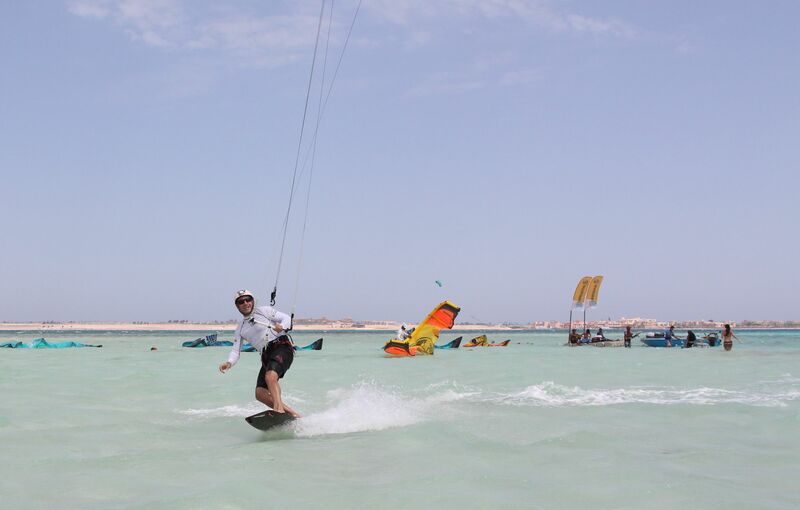 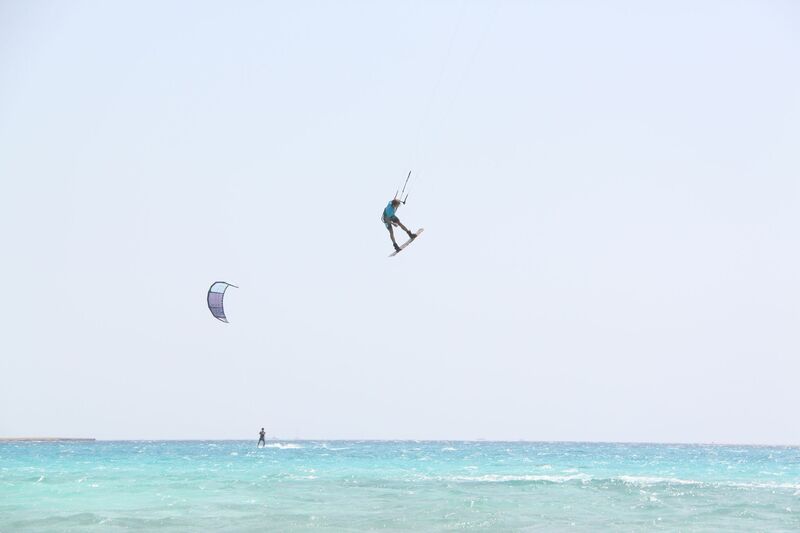 The morning program included two Air style clinics with Nick Jacobsen, whose participants are Kite Instructors, Station Managers & passionate Kiters working / kiting in Soma Bay, Safaga & Ras Sudr. 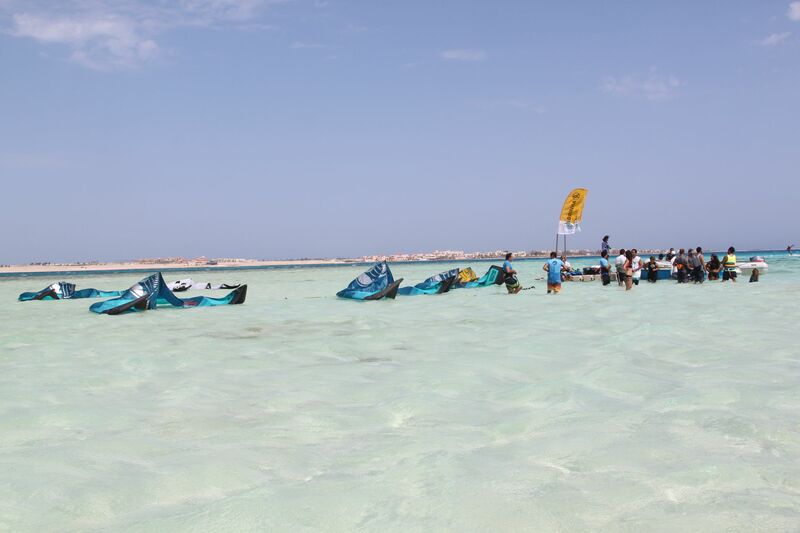 The event brought together colleagues from #KiteHouse #TheBreakers #SurfMotion #TornadoSurf #SoulKitesurfing #20KnotsKitesurfingCamp #FlyKitesurfing #CabrinhaEgypt #Cabrinha who all added to the sportive & positive atmosphere of the day. 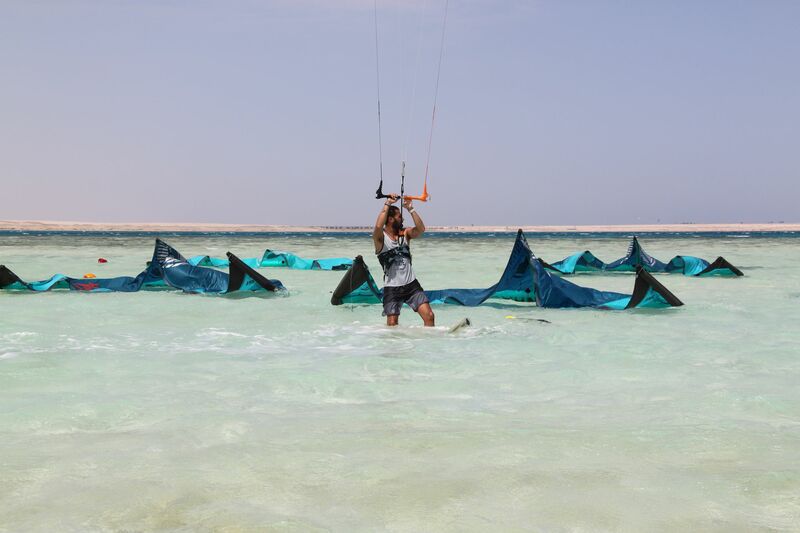 As the boat approached the spot, everyone took out his camera to take a memory of this beautiful view: In the middle of turquoise water the 2018 Radar, Switchblade, FX, Contra & Apollo kites were lined-up & were just waiting to be launched and tested! It was a joy for the eye and the chilled mood from cruising on the boat turned into lively excitement to get on the water and to try out the gear in this beautiful spot! While Nick was guiding his students in the water, people were testing the new 2018 gear, discussing developments with Cabrinha Team members & discovering the performance in excellent conditions: Steady strong wind at a very unique spot, which has perfect conditions for beginners, freestylers and those who found their new challenge & pleasure in foiling! The range of different 2018 boards from XCaliber (wood & carbon), the Spectrum, the ACE (wood & carbon) & the Double Agent Foil Board saw many feeds on that day as people were swapping boards & kites, to make sure everyone can benefit from testing the whole range of 2018 Cabrinha gear. 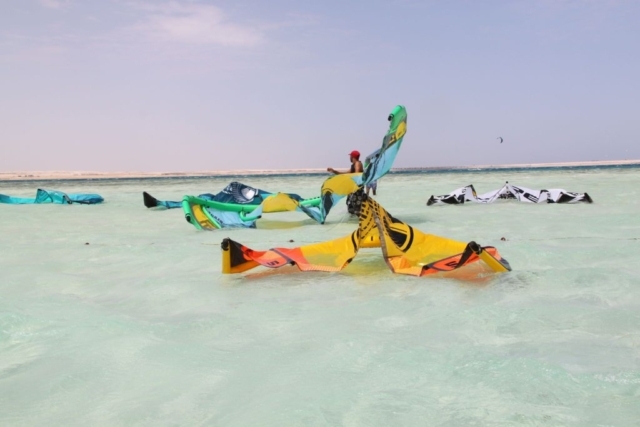 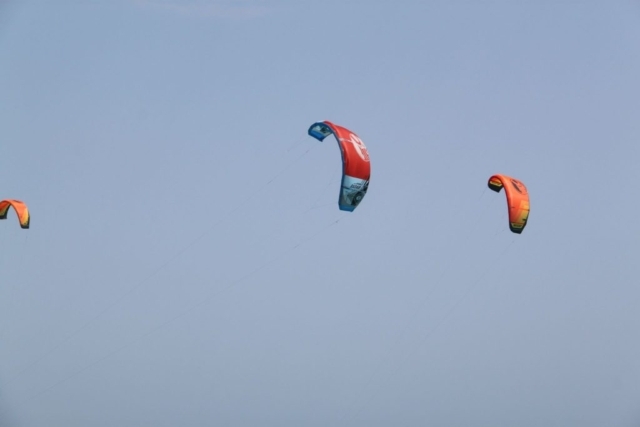 While the set-up in the water was unfamiliar to most people, the organisation at the spot made it easy and time-saving to allow swopping in no time; it was an intensive kite session for everyone! 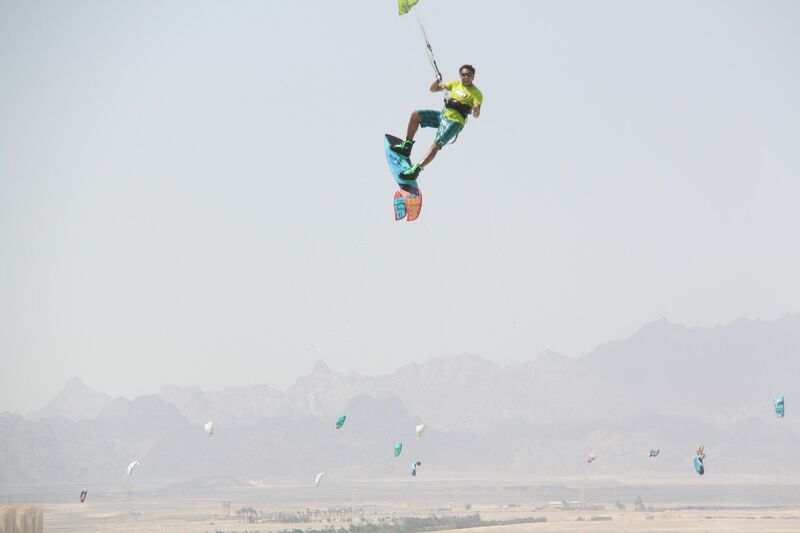 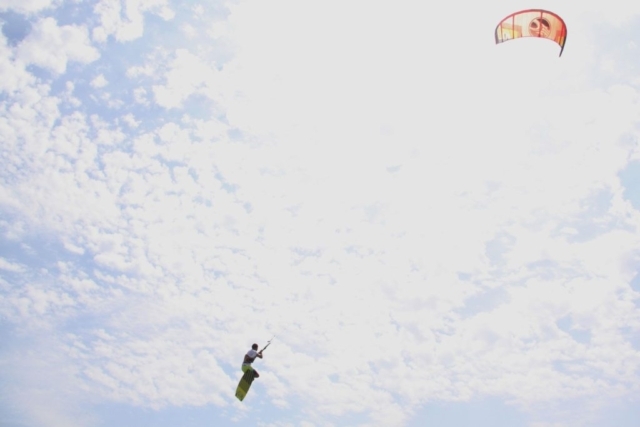 The presence of Nick Jacobsen and seeing his unique style in the air, made everyone enthusiastic to try out tricks and jumps which turned the spot into a spectacle of freestyle kitesurfing! 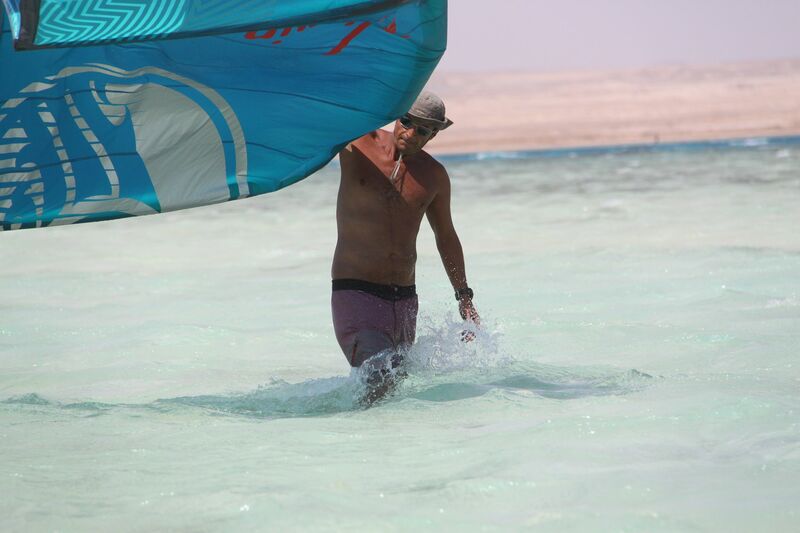 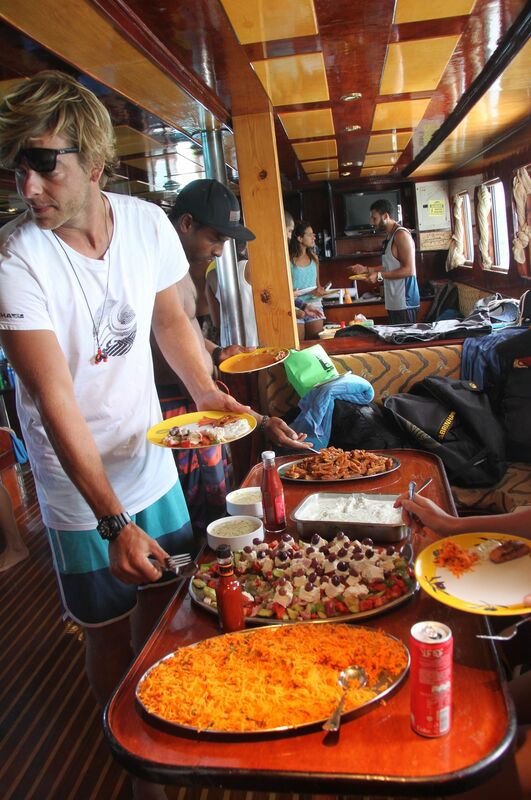 After the morning session, everyone enjoyed a quick fresh-water shower on the Kite Boat, a simple, healthy & delicious lunch & refilled his/her energies to be ready for another kite session in the afternoon. 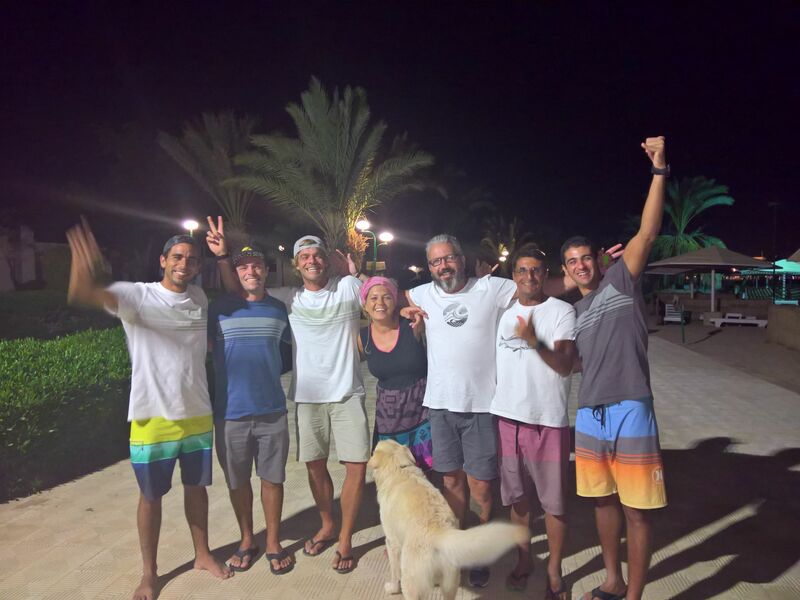 Nick simply walked up to the upper boat-deck and jumped off, took the little Hannah on his back for a ride, jumped over people and had fun with his teasing tricks, while others continued testing the 2018 Cabrinha gear and enjoyed the last hours of the wind. 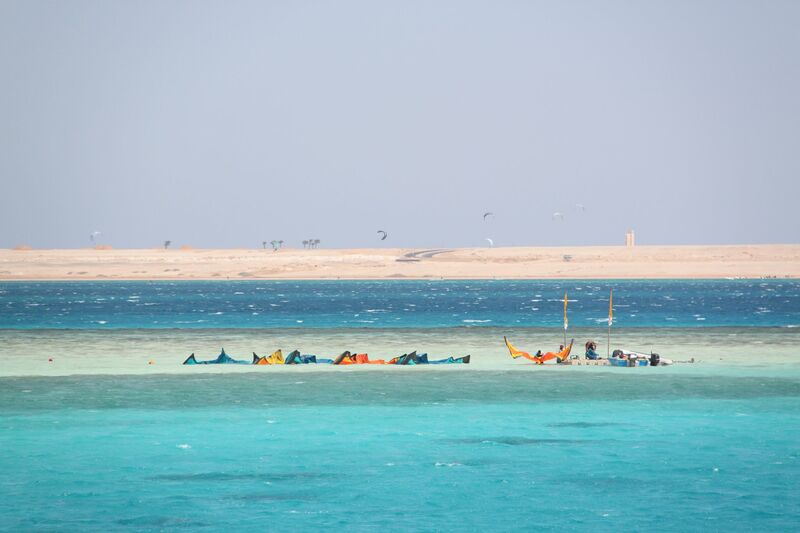 The famous “7 km Downwinder back to Hawa Station” was postponed to the next visit, as the wind dropped at 4 pm and most riders were happy to chill after an intensive kitesurfing day! 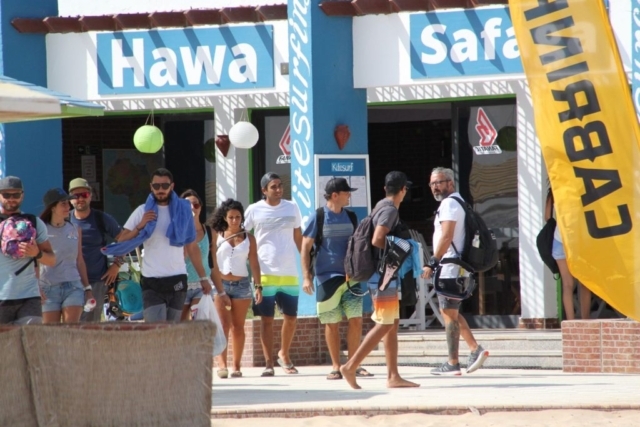 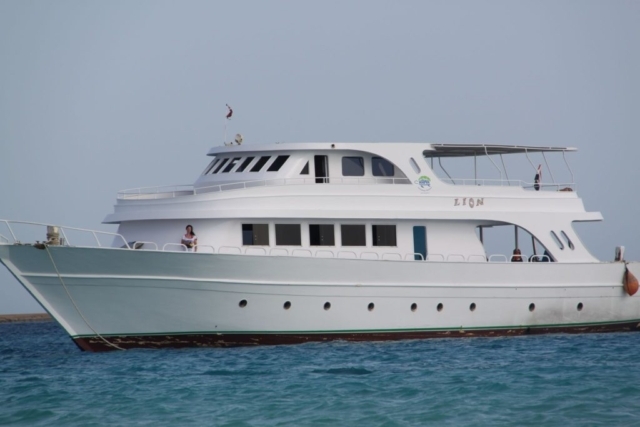 So during the return cruise from Soma Bay to Hawa Station, people enjoyed a drink on the deck & the chilled atmosphere while watching the sun setting down behind the mountains & chit-chatting with one another. 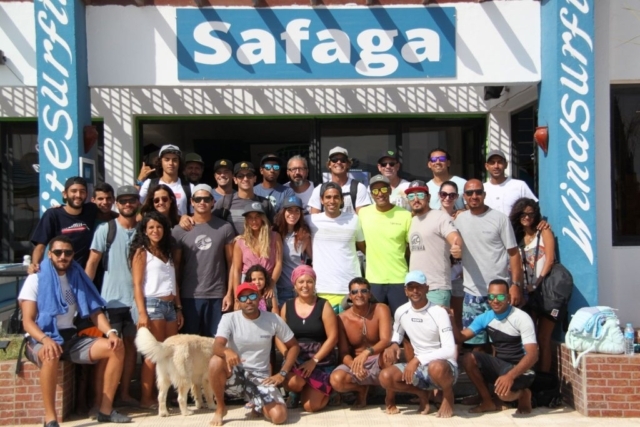 Back at Hawa Station, the day was rounded up with an aperitif and a fish dinner for Cabrinha & Hawa Safaga Team members to recap on the day and to expand new relations & business opportunities. This event was unique in its kind, Cabrinha showed presence & support to its local distributer #CabrinhaEgypt & school customer #HawaSafaga, while having a fantastic time discovering the unique Spot “Hawa Platform”, the potential of whole Soma Bay & expanding the Cabrinha-family-community-feeling. 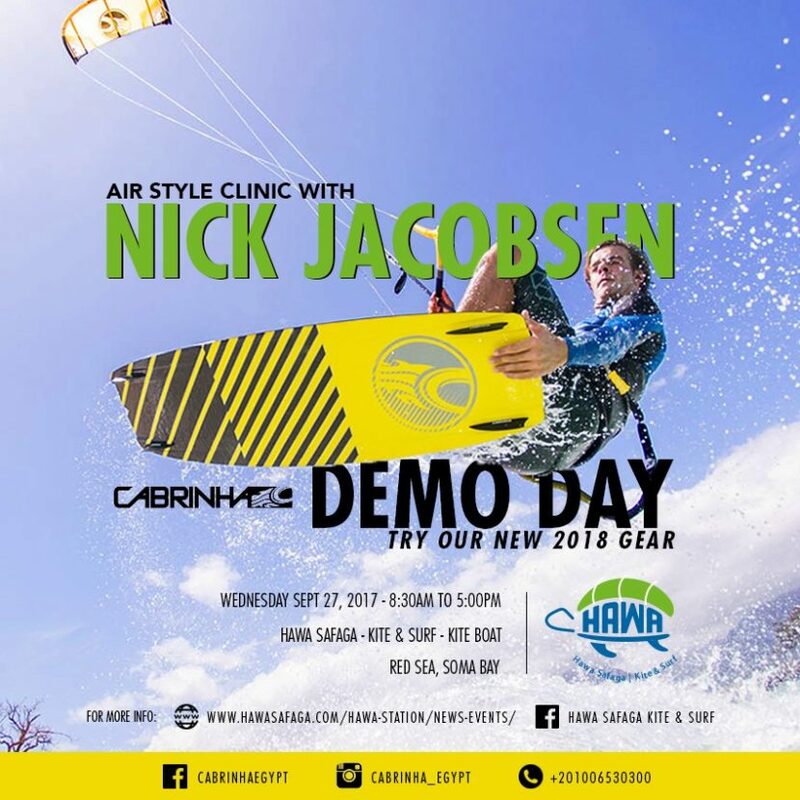 All participants had the chance to test the 2018 Cabrinha gear, to benefit from the expertise of Nick Jacobsen and to see the 2017 King of the Air Champion performing life & having a good time himself! 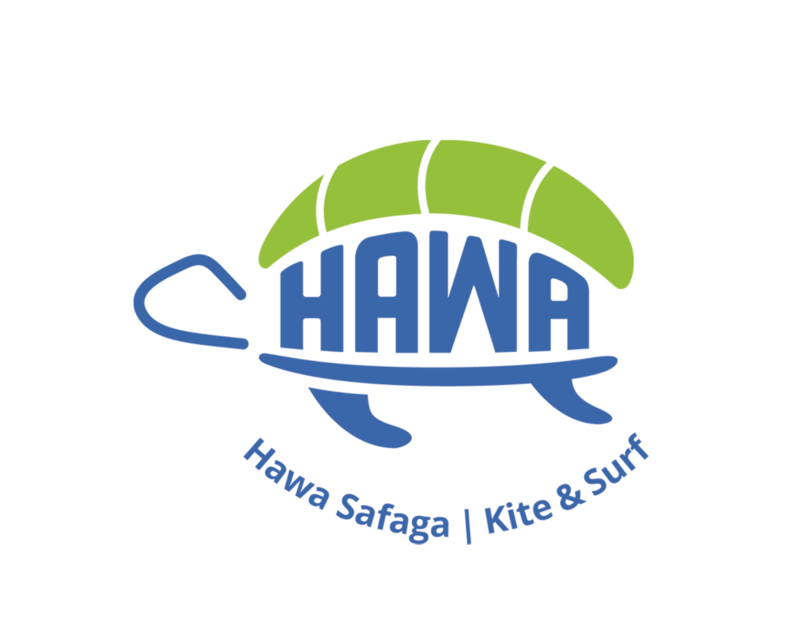 Thank you @NickJacobsen, @KlausWarkentin, @DavidHastilow, @Cabrinha @CabrinhaEgypt for coming & welcoming us to the Cabrinha world! Thanks to all who came from far & near @TheBreakers @KiteHouse @Tornado @SurfMotion @20KnotsKitesurfingCamp @SoulKitesurfing @FlyKitesurfing & all non-associated guests!